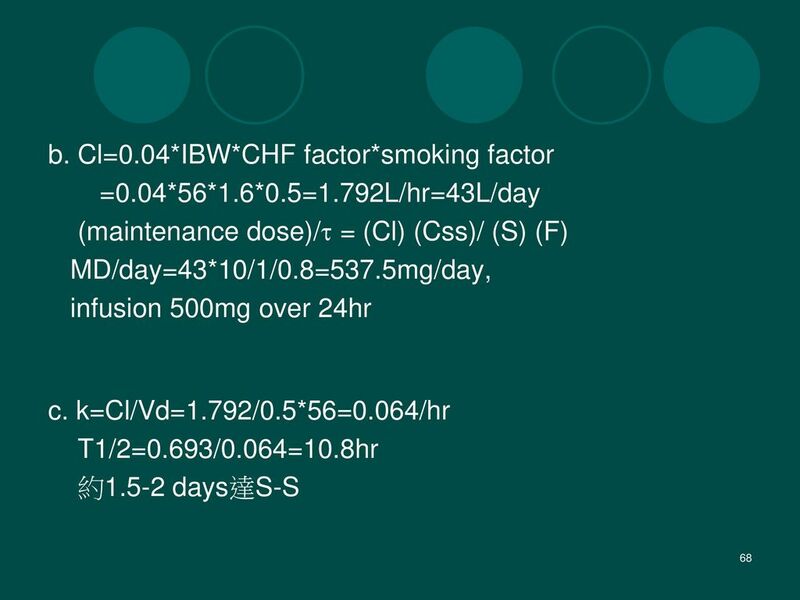 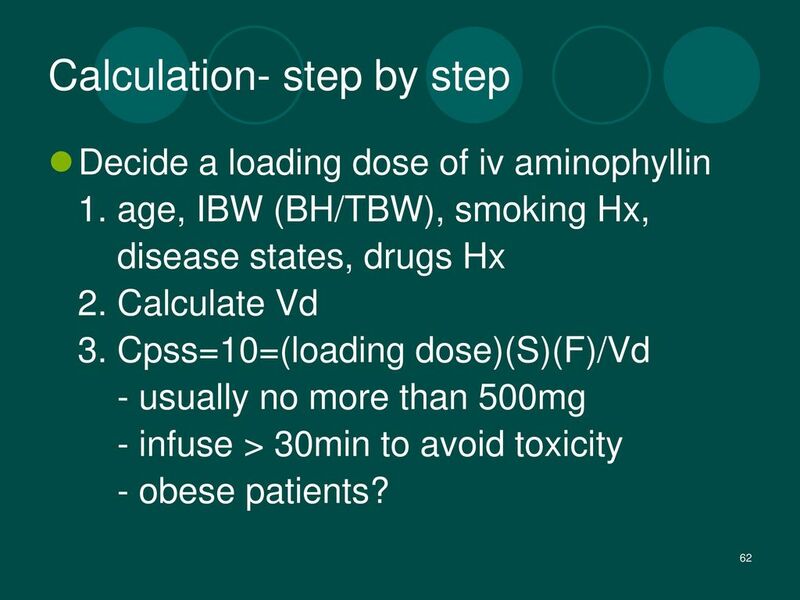 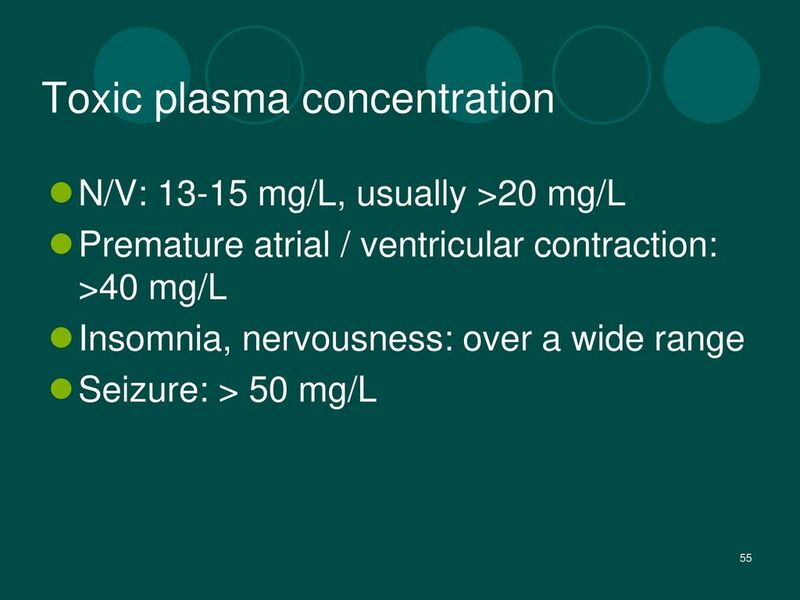 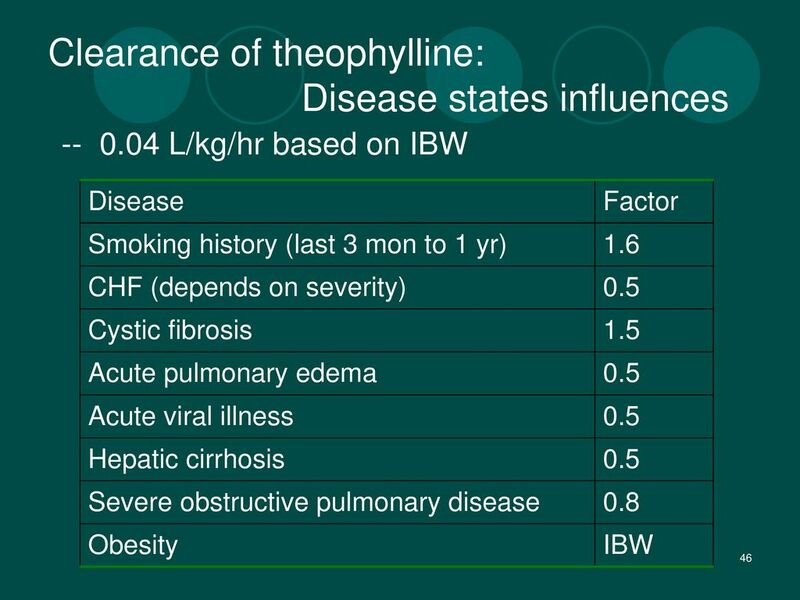 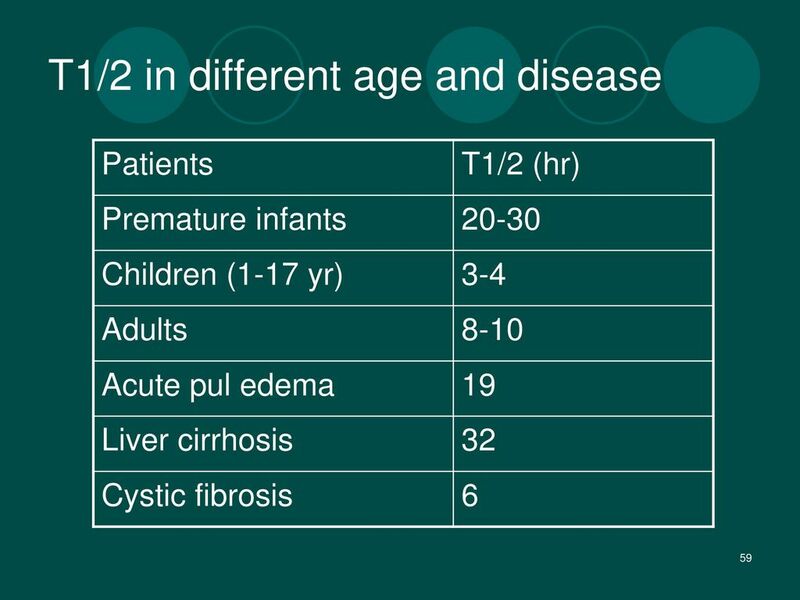 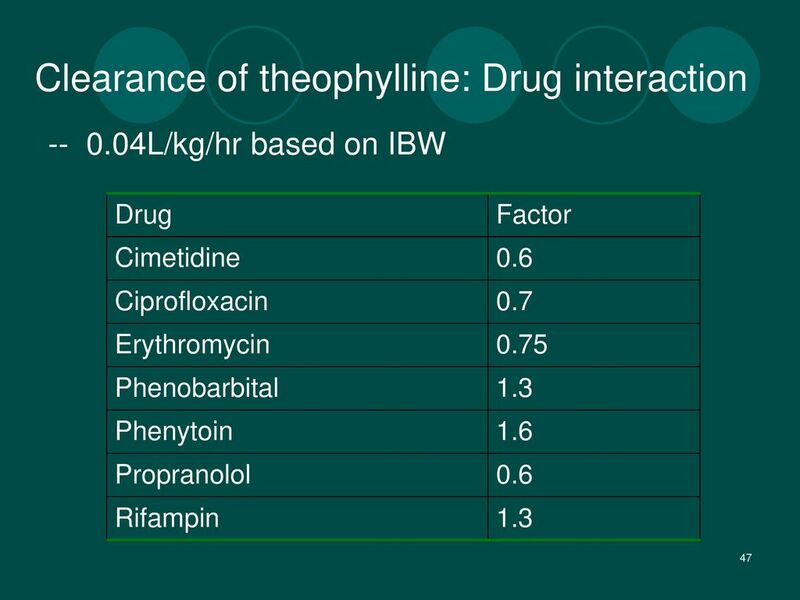 Decide a loading dose of iv aminophyllin 1. age, IBW (BH/TBW), smoking Hx, disease states, drugs Hx 2. 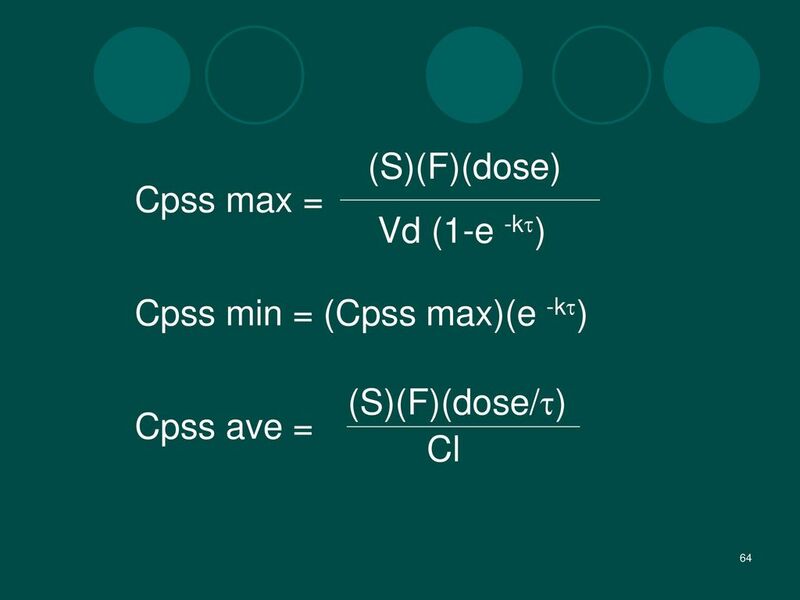 Calculate Vd 3. 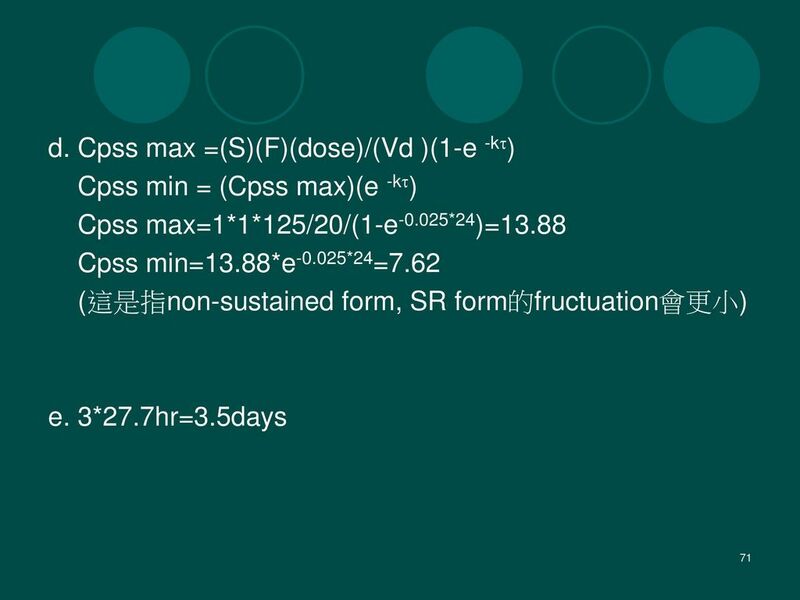 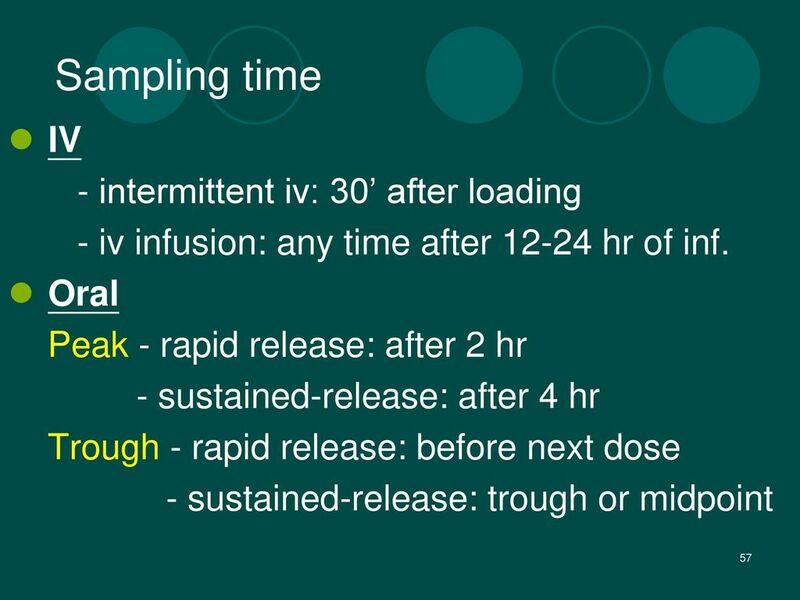 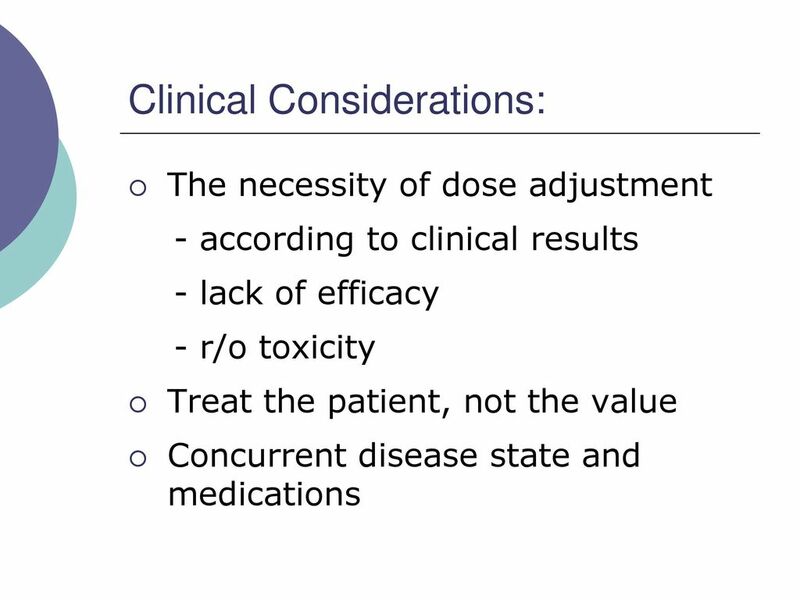 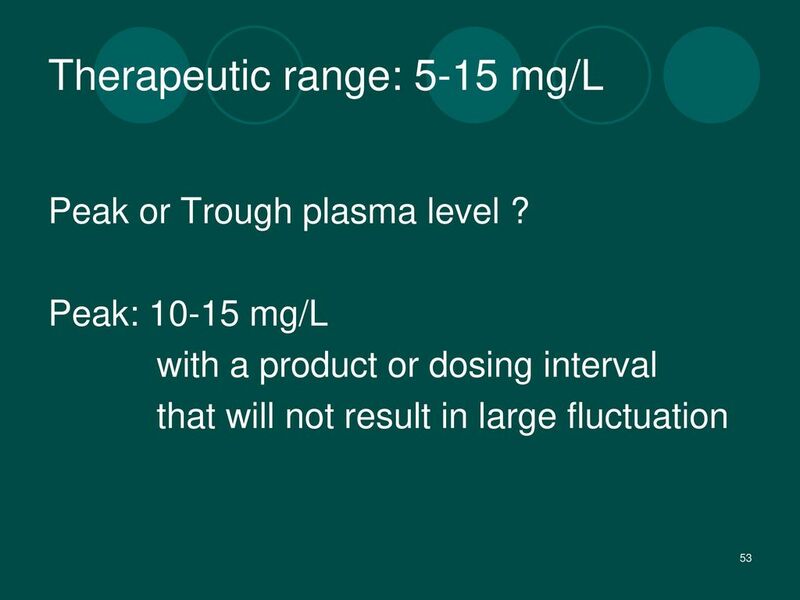 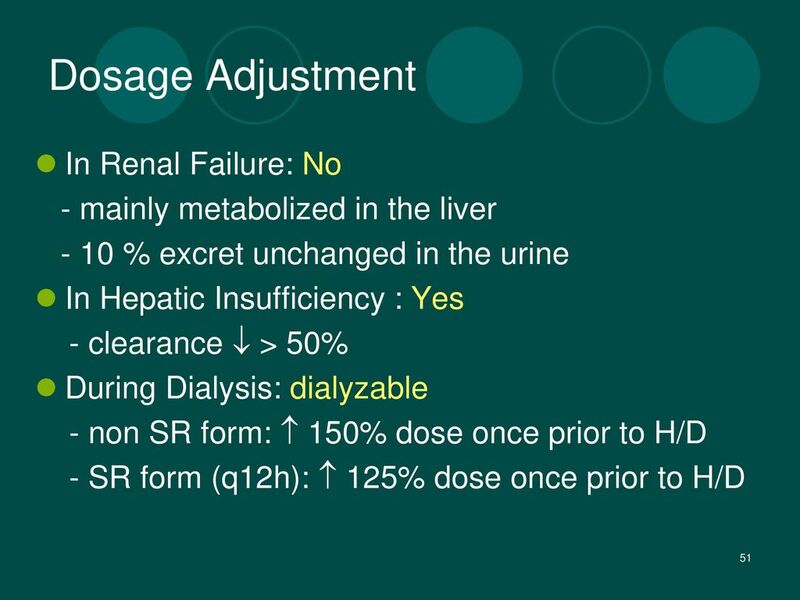 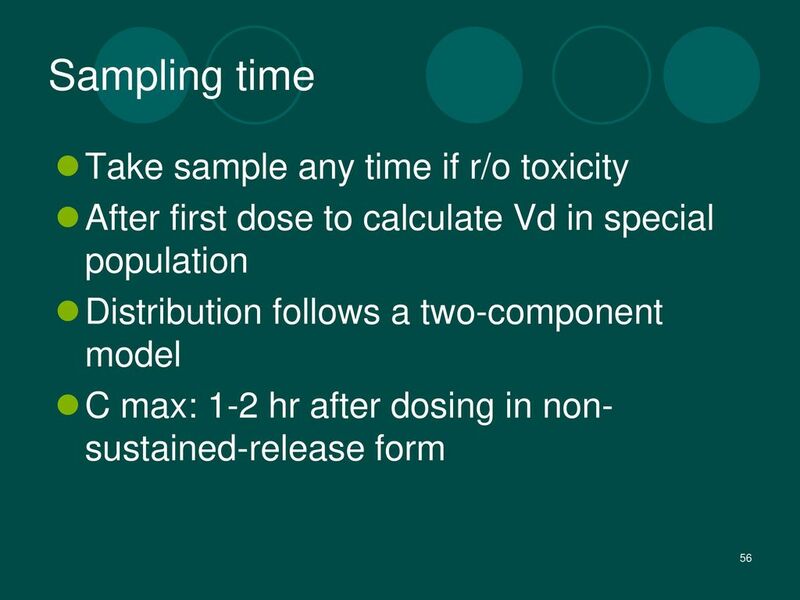 Cpss=10=(loading dose)(S)(F)/Vd - usually no more than 500mg - infuse > 30min to avoid toxicity - obese patients? 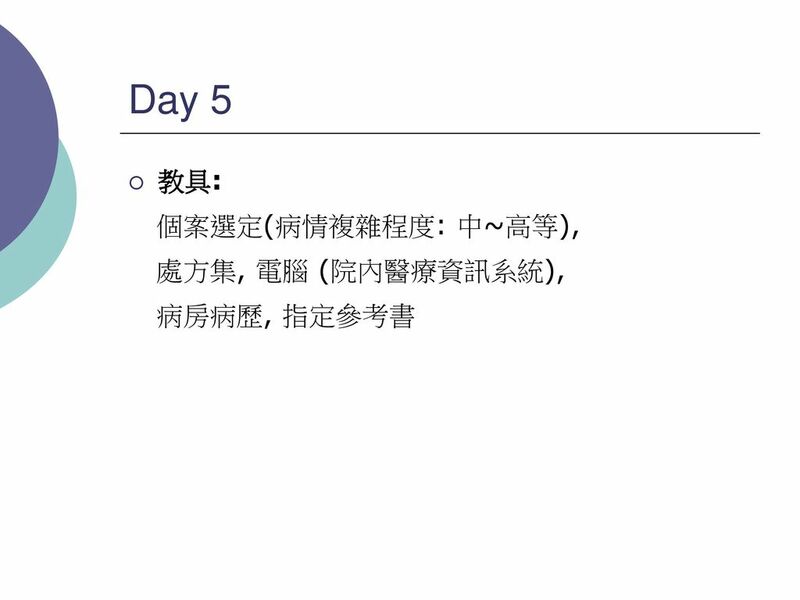 65 Thank you for your attention and awaking ! ! 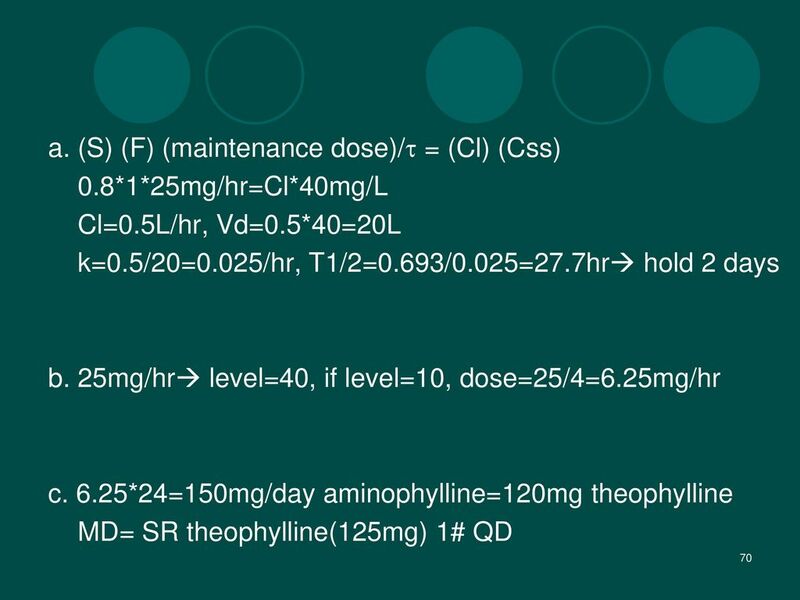 72 Q3. 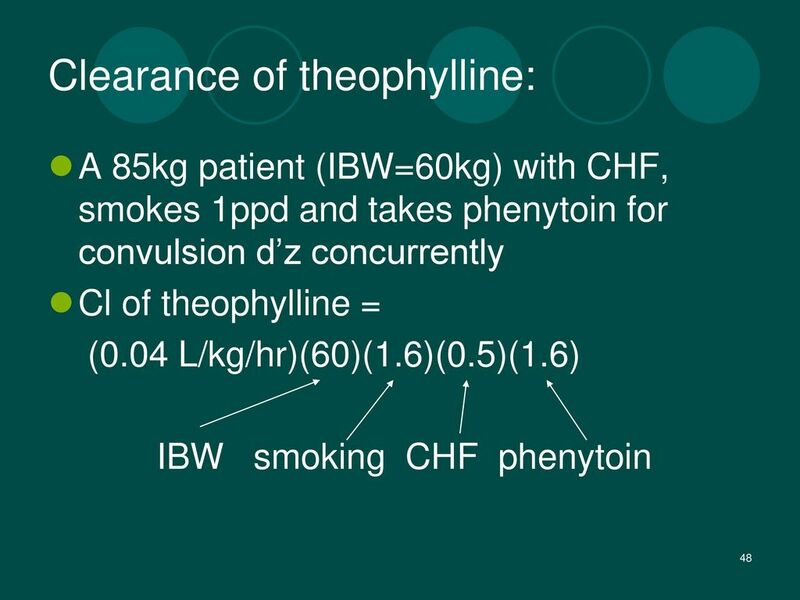 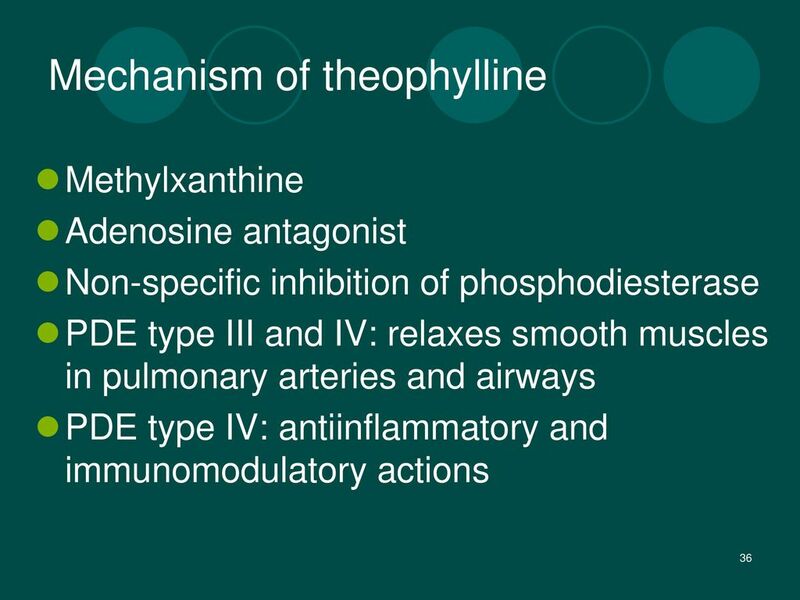 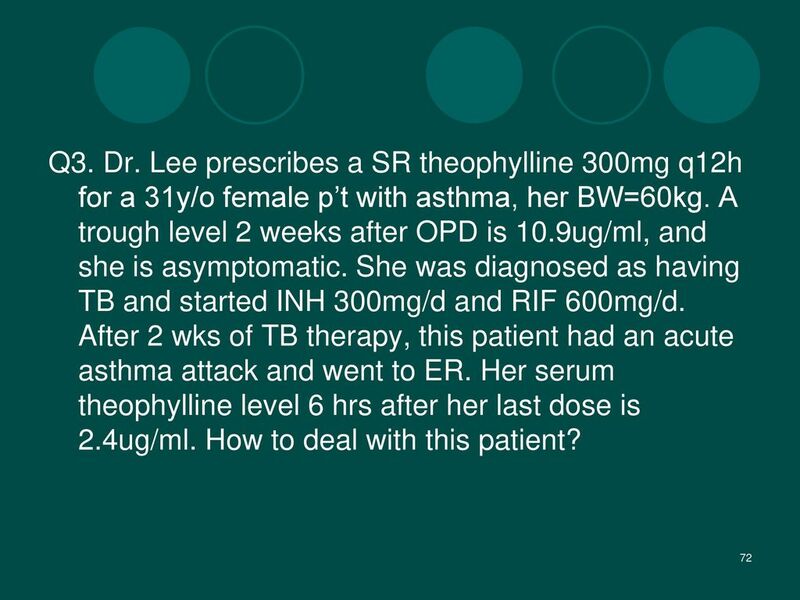 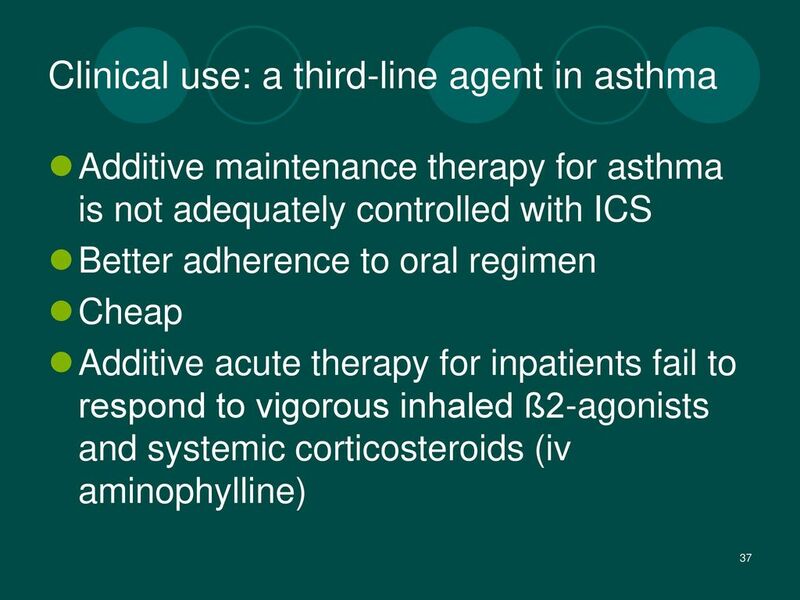 Dr. Lee prescribes a SR theophylline 300mg q12h for a 31y/o female p’t with asthma, her BW=60kg. 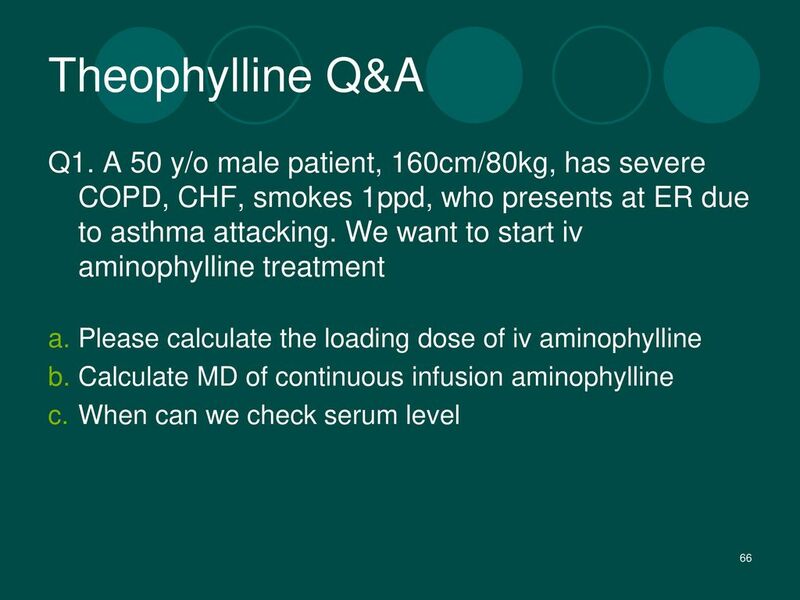 A trough level 2 weeks after OPD is 10.9ug/ml, and she is asymptomatic. 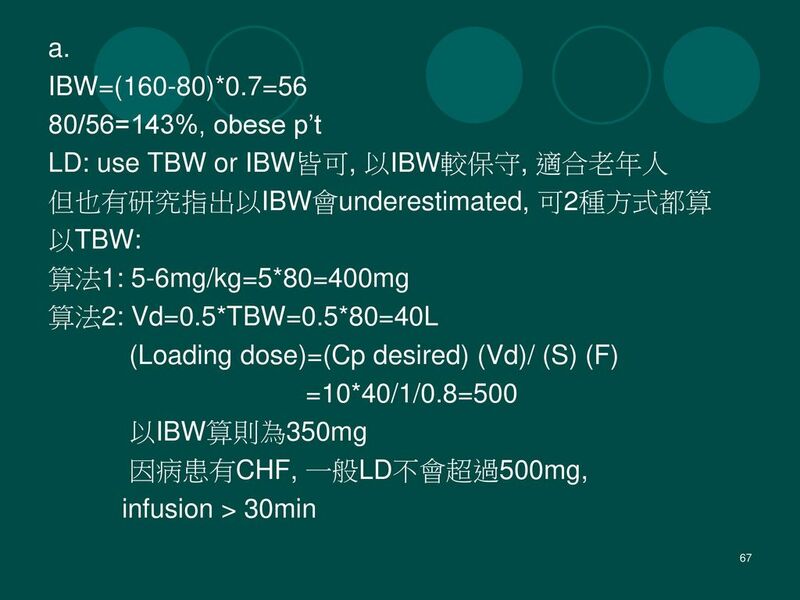 She was diagnosed as having TB and started INH 300mg/d and RIF 600mg/d. 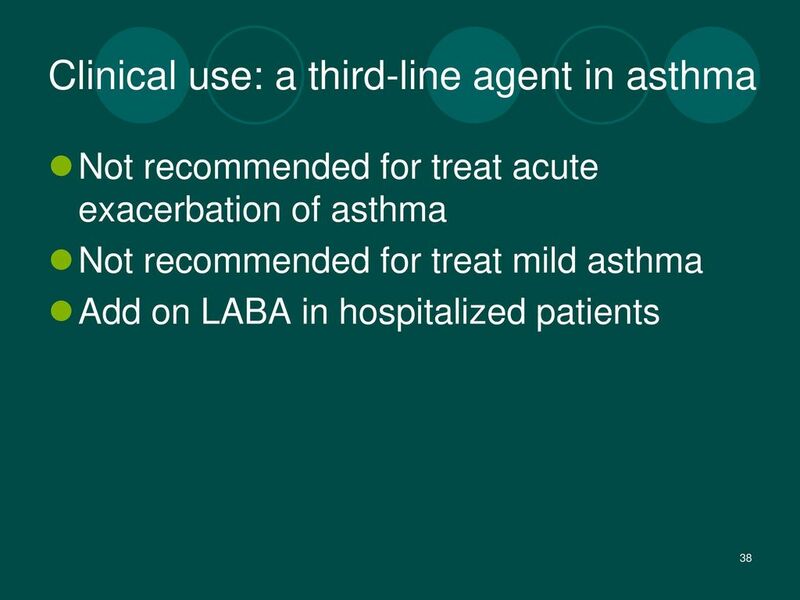 After 2 wks of TB therapy, this patient had an acute asthma attack and went to ER. 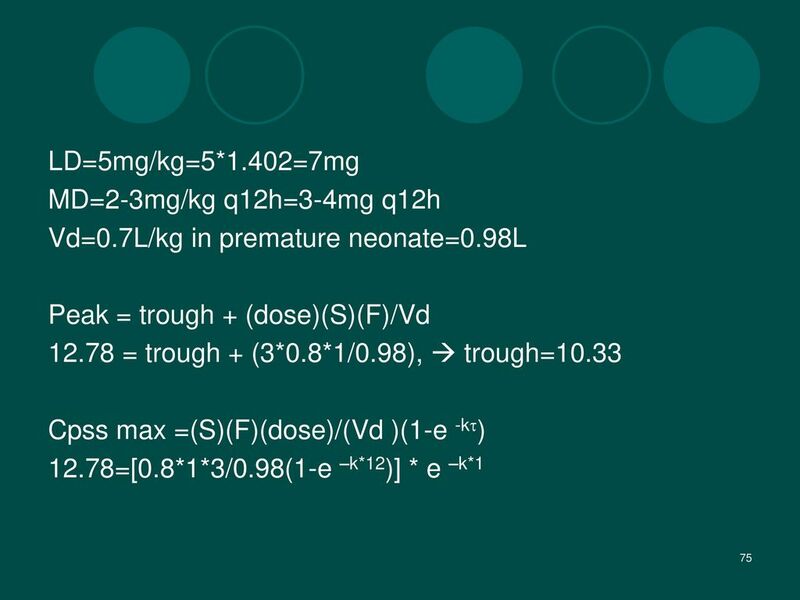 Her serum theophylline level 6 hrs after her last dose is 2.4ug/ml. 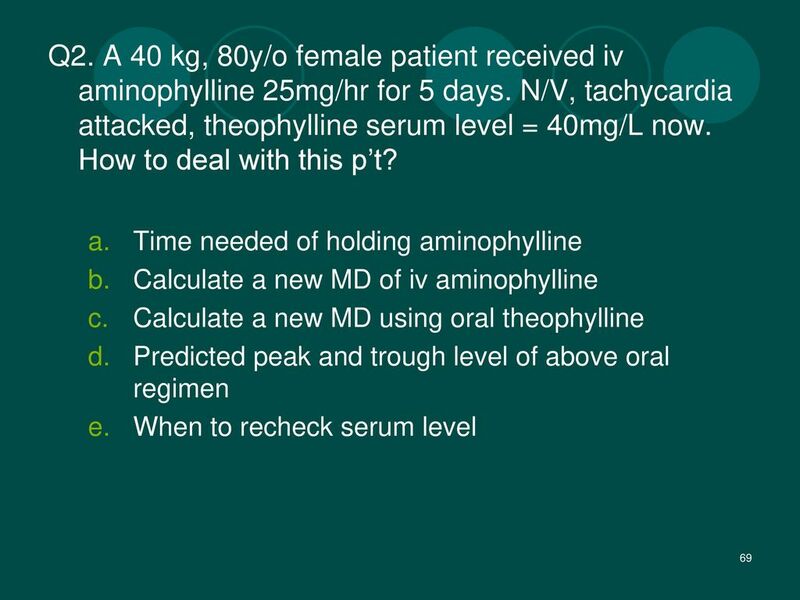 How to deal with this patient? 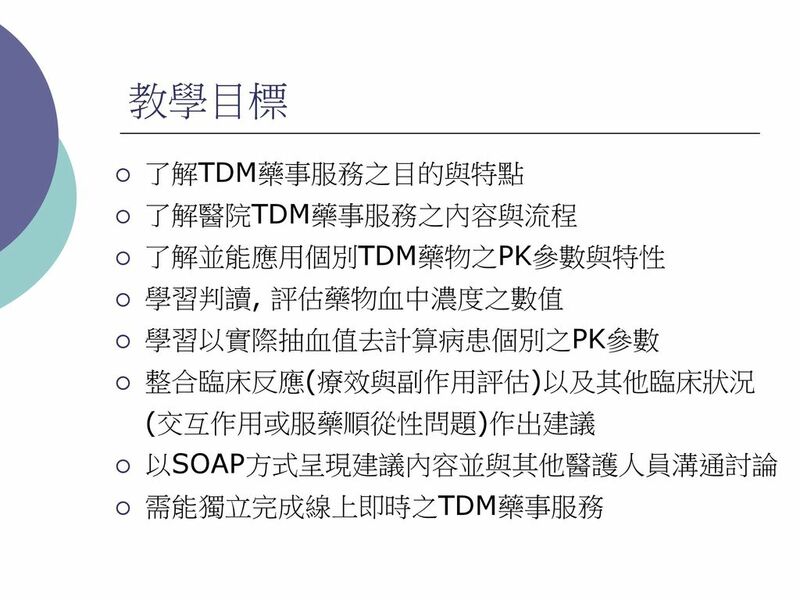 74 Q4. 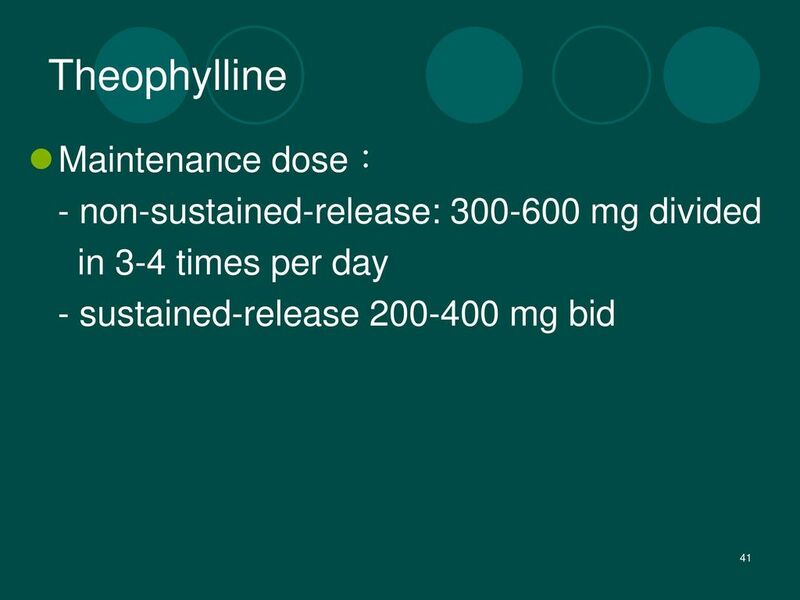 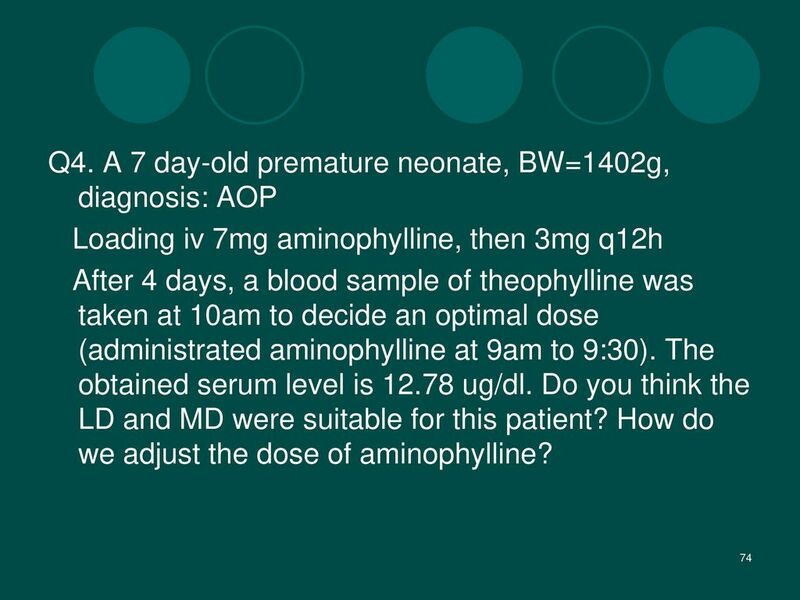 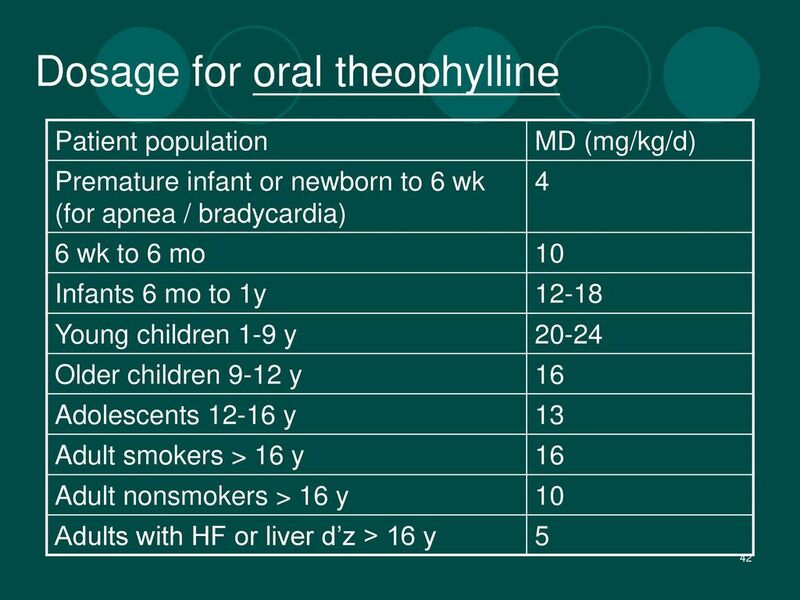 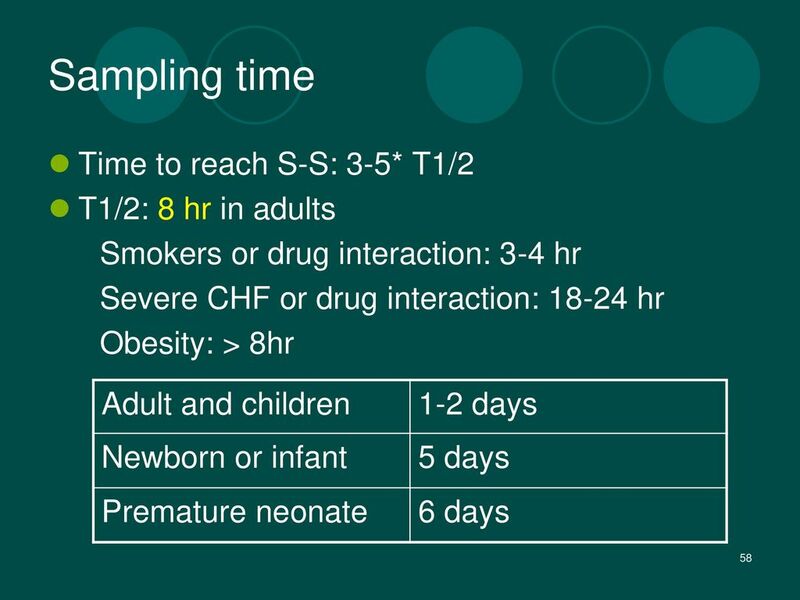 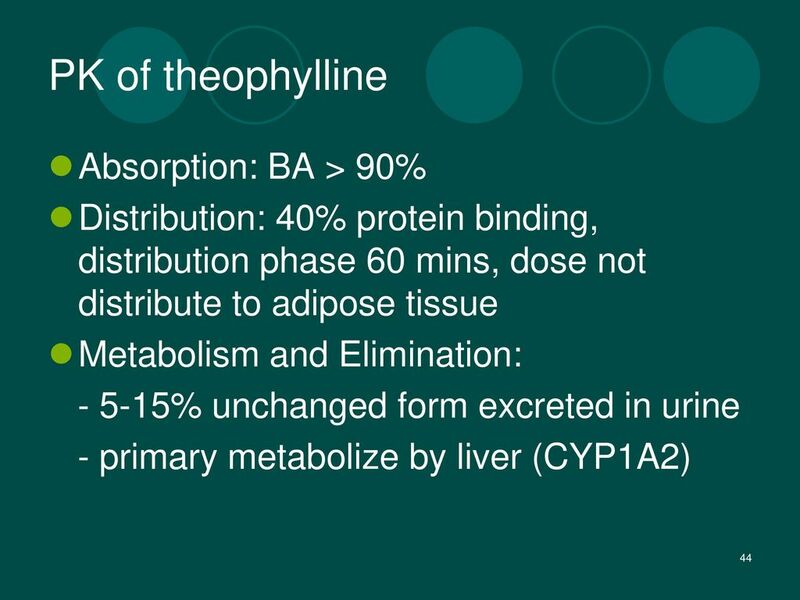 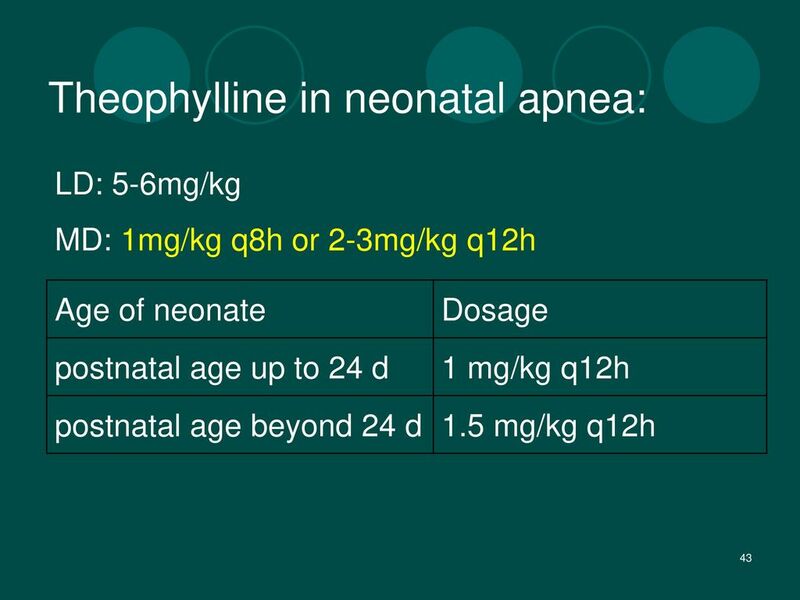 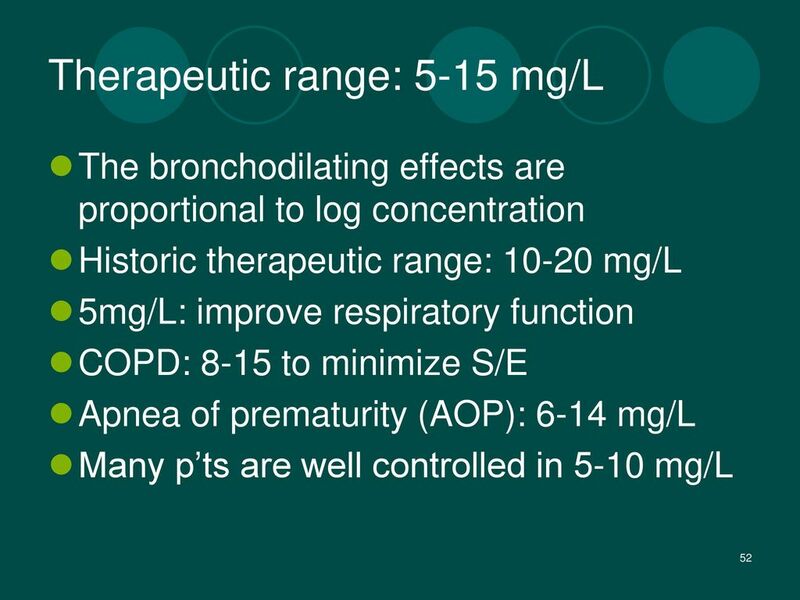 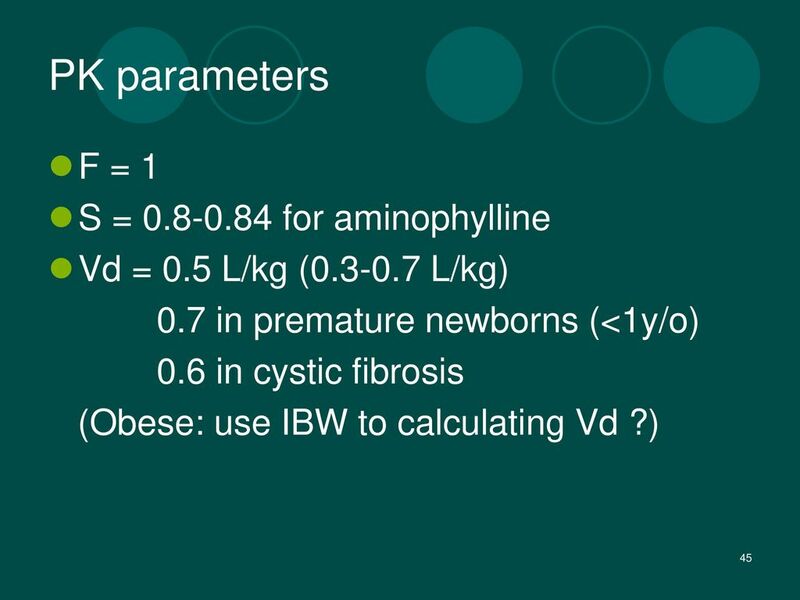 A 7 day-old premature neonate, BW=1402g, diagnosis: AOP Loading iv 7mg aminophylline, then 3mg q12h After 4 days, a blood sample of theophylline was taken at 10am to decide an optimal dose (administrated aminophylline at 9am to 9:30). 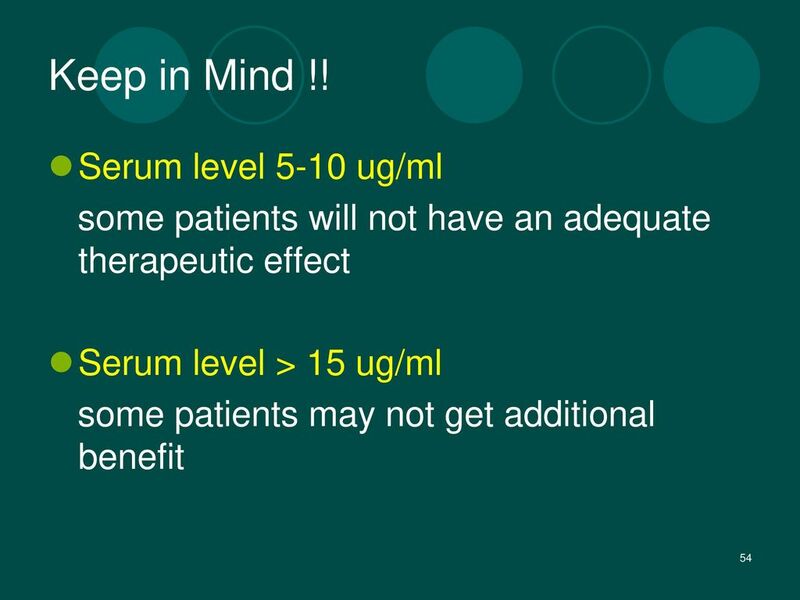 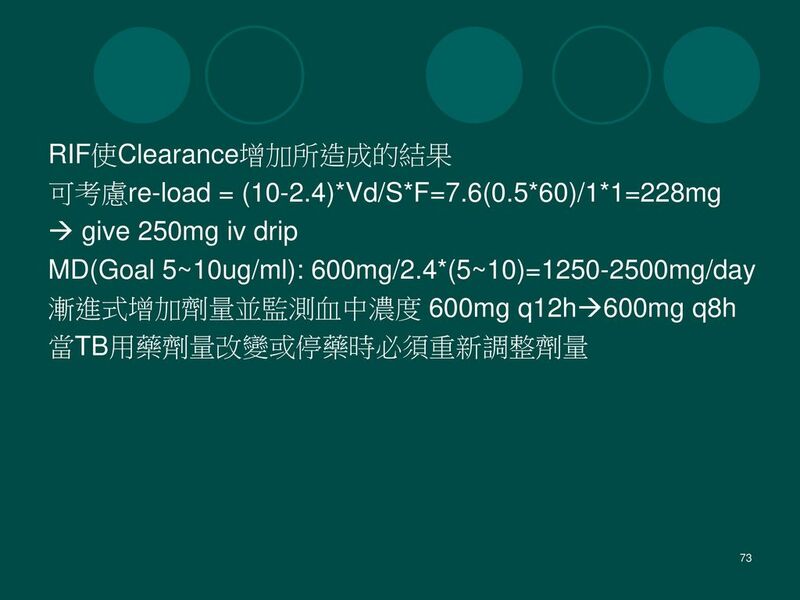 The obtained serum level is ug/dl. 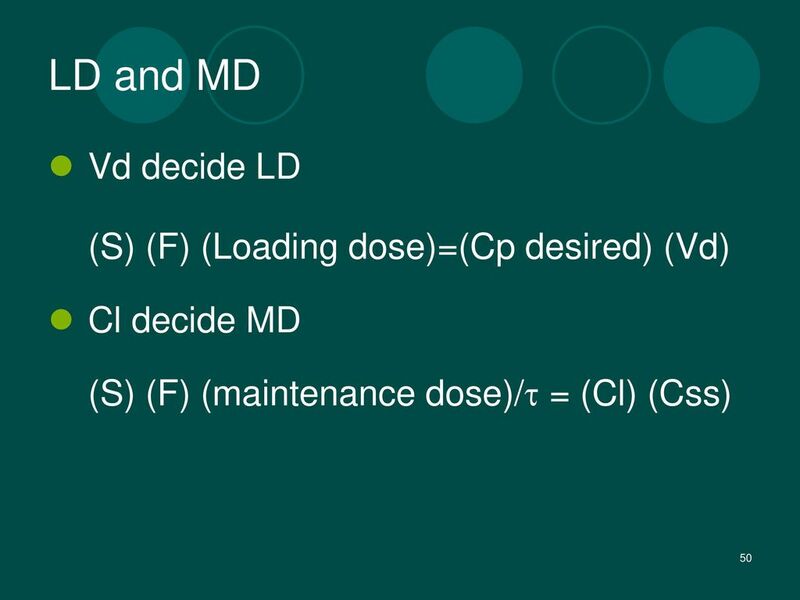 Do you think the LD and MD were suitable for this patient? 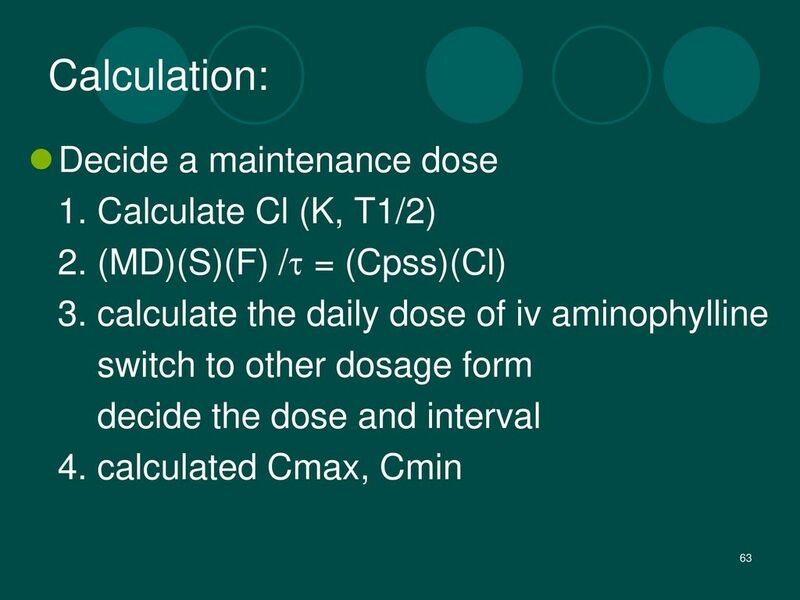 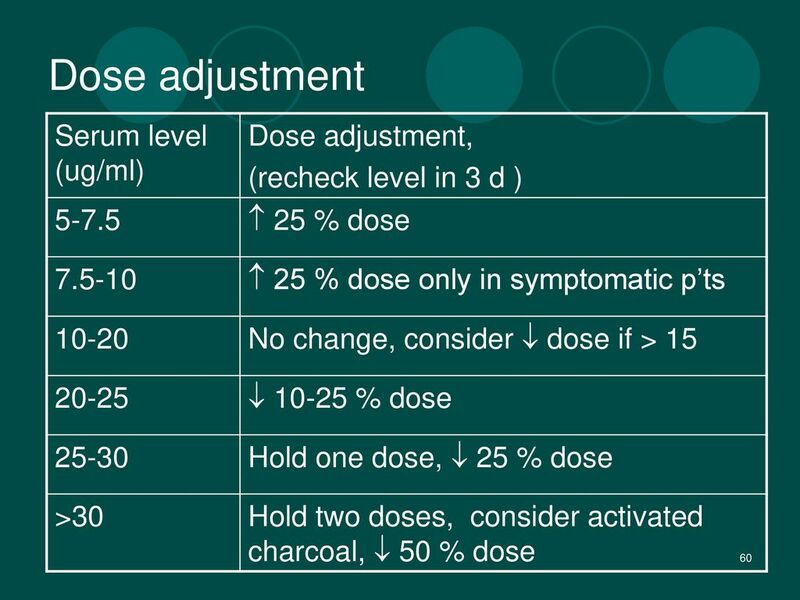 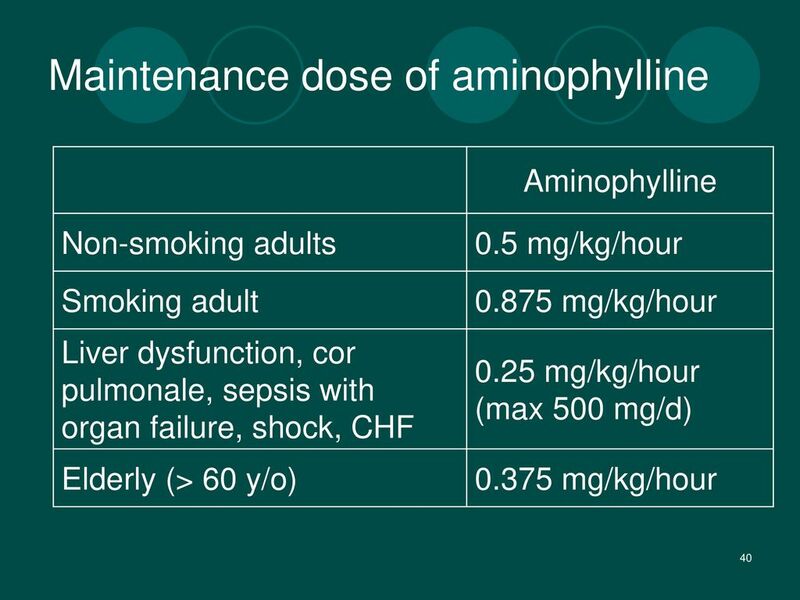 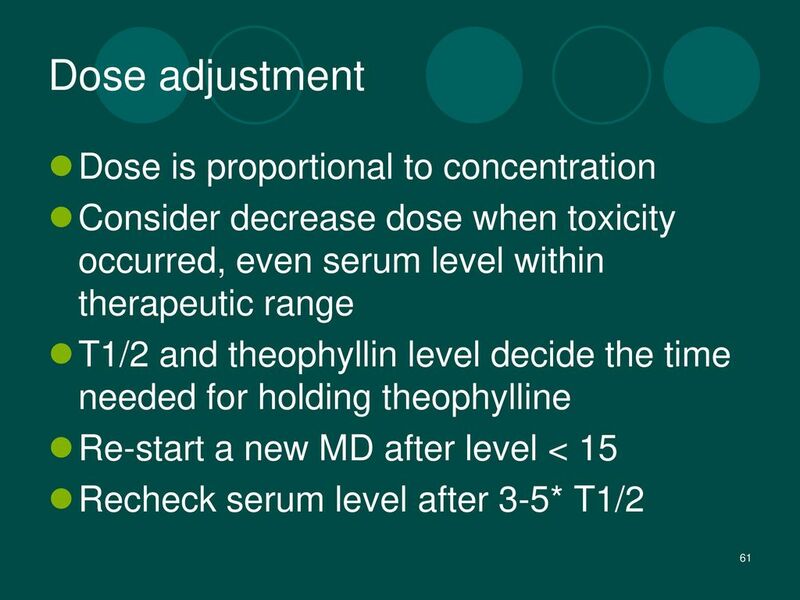 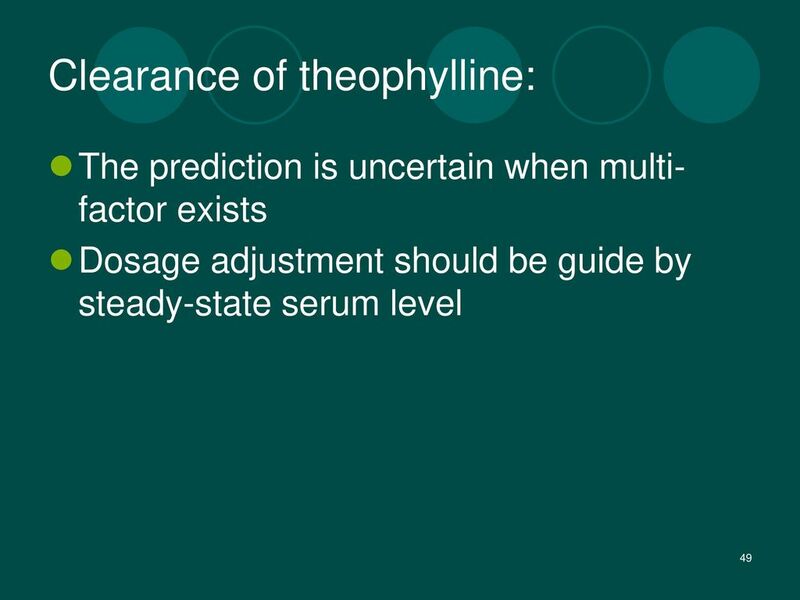 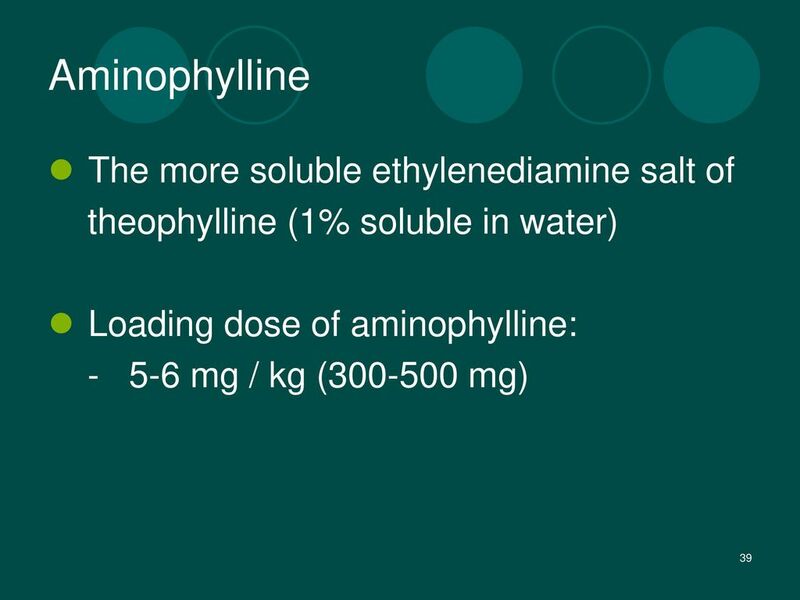 How do we adjust the dose of aminophylline? 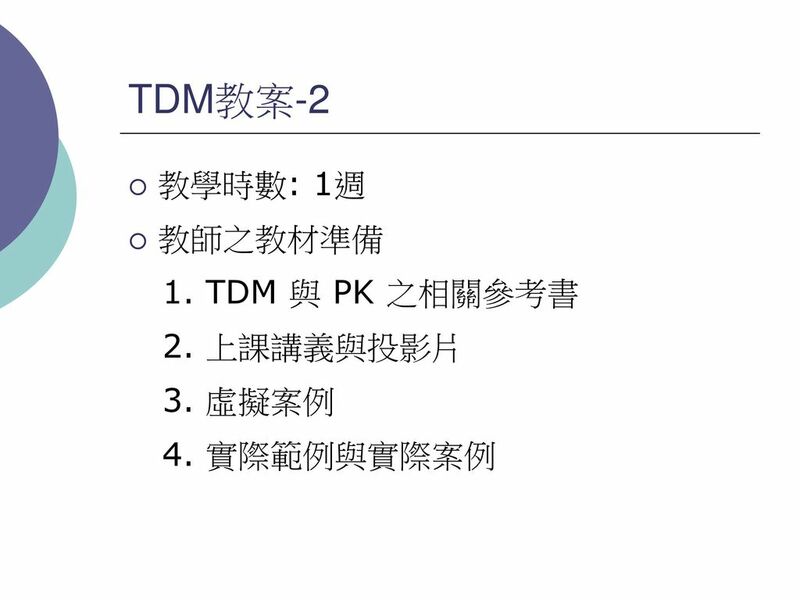 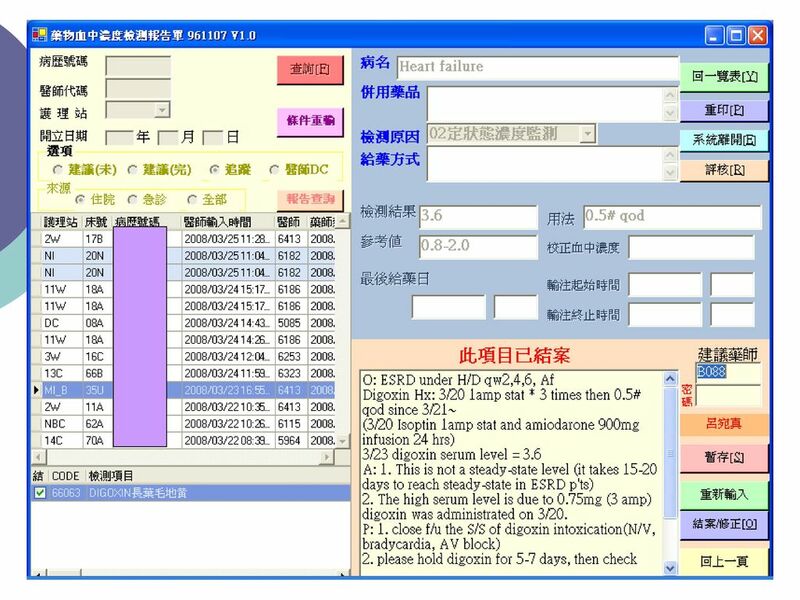 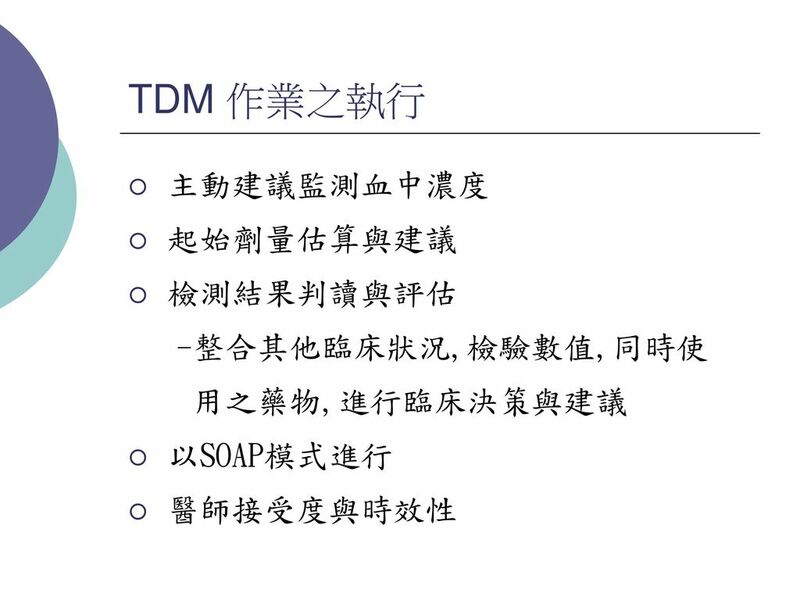 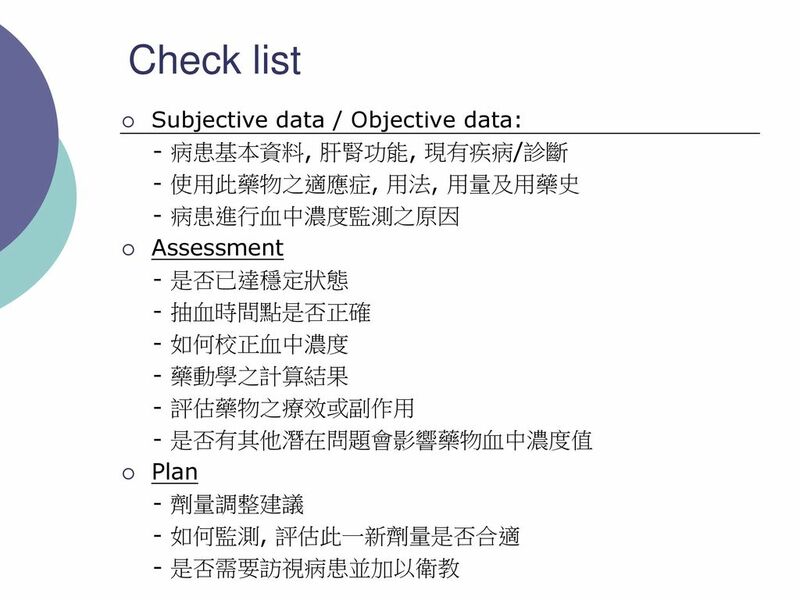 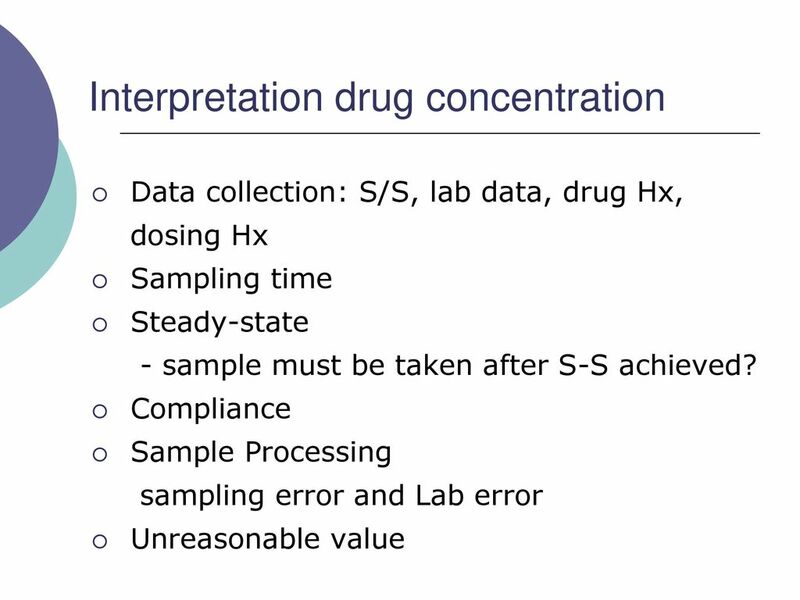 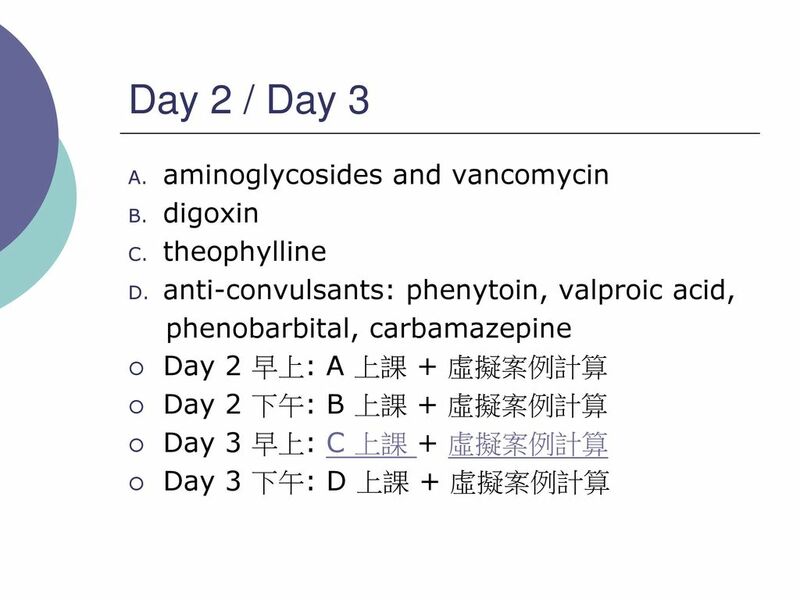 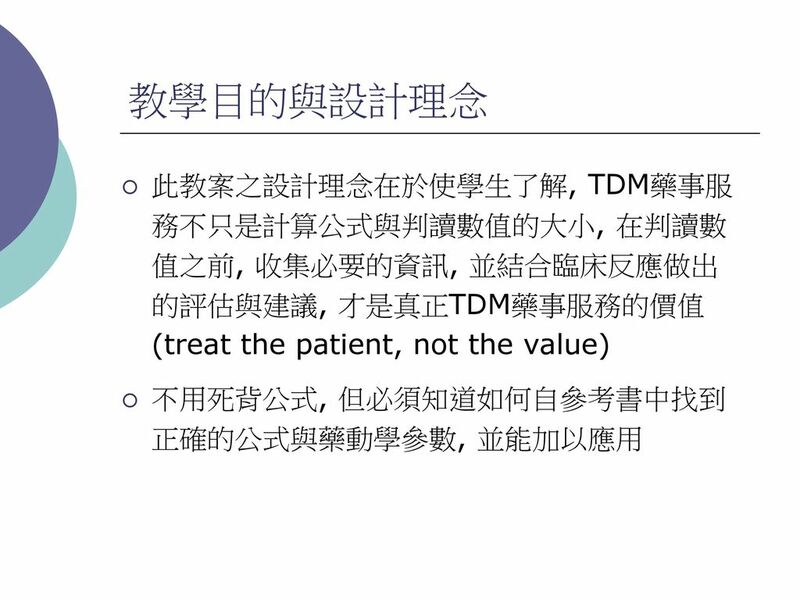 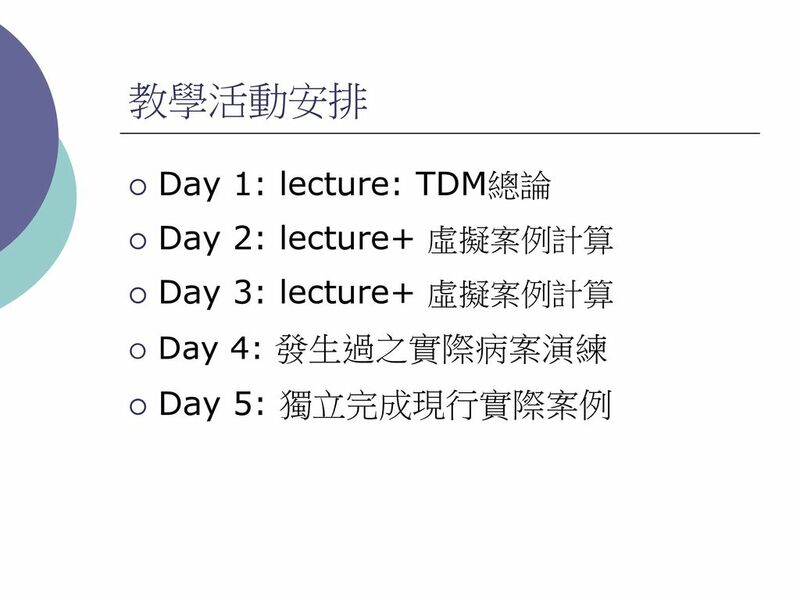 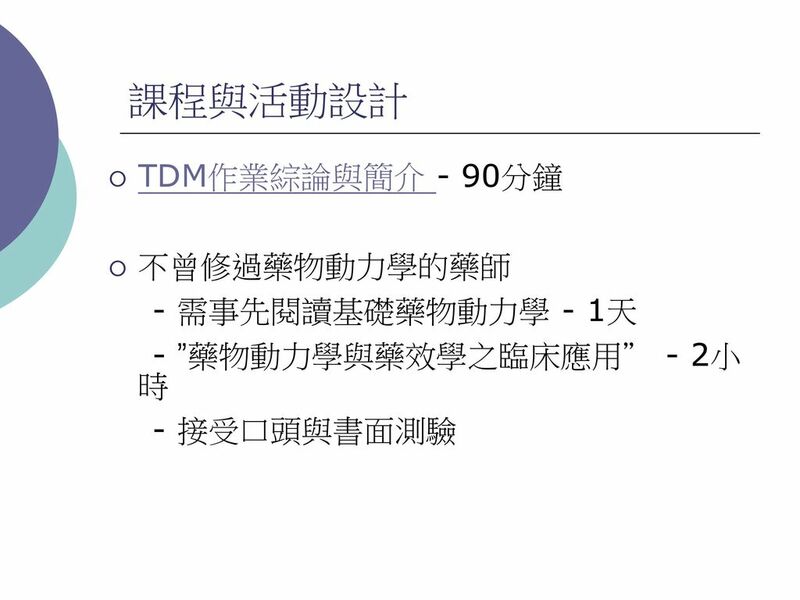 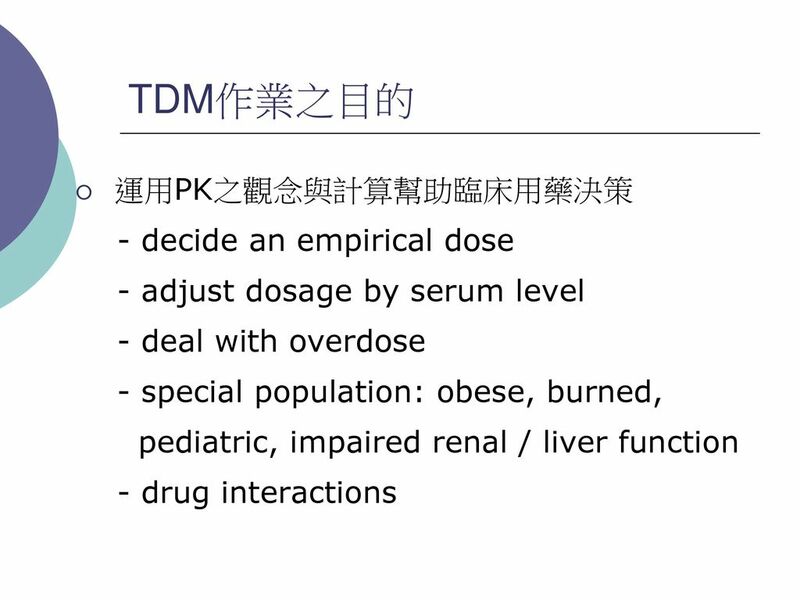 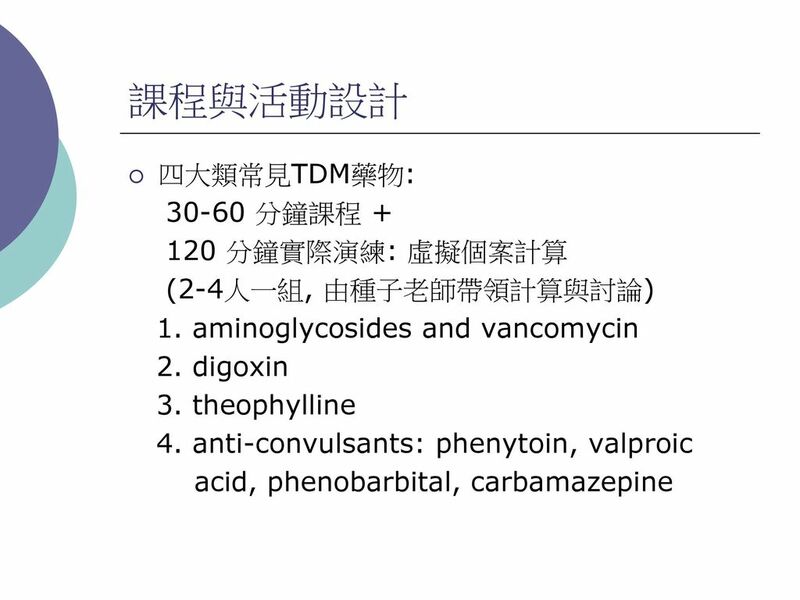 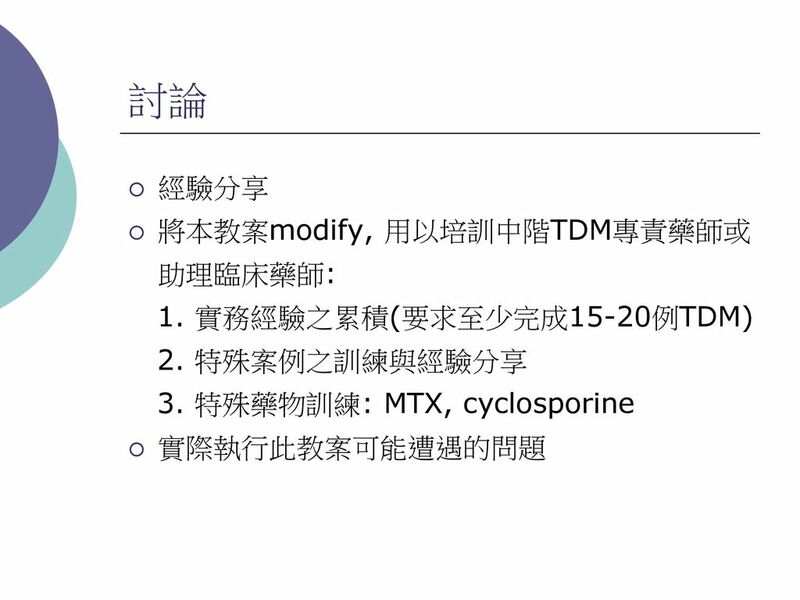 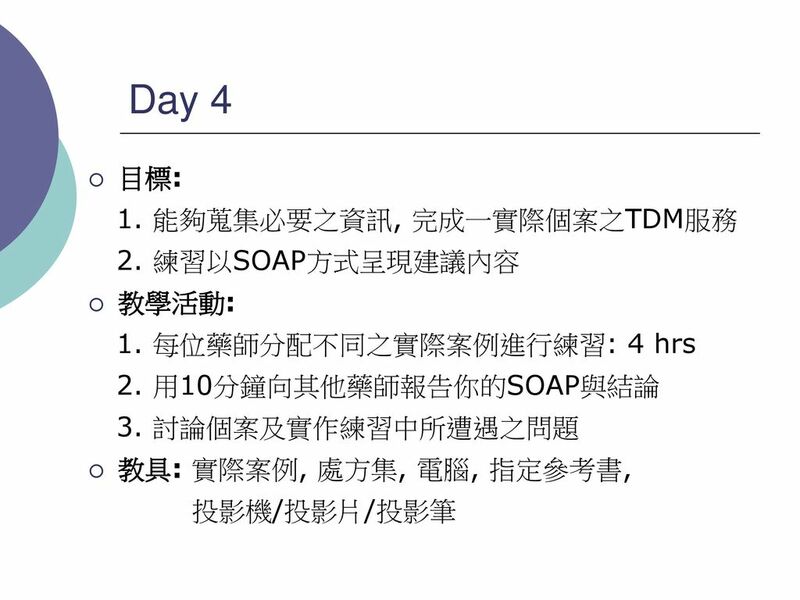 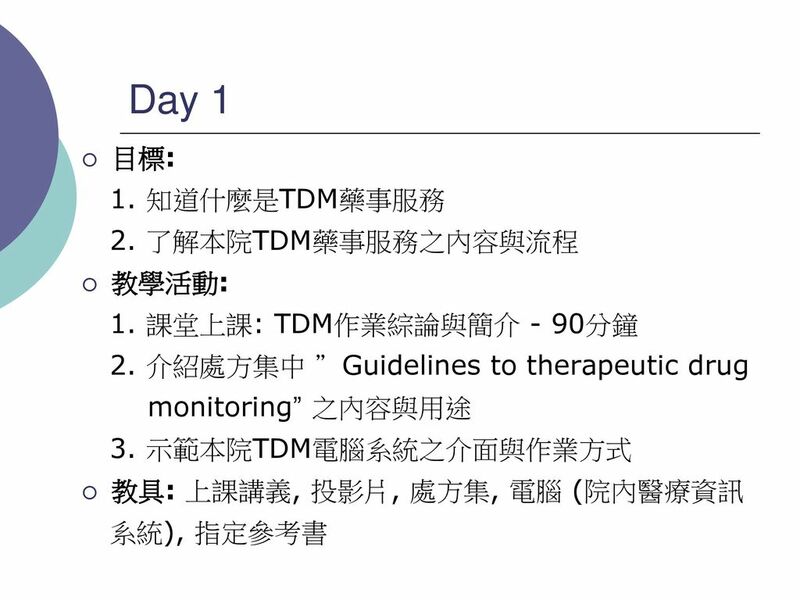 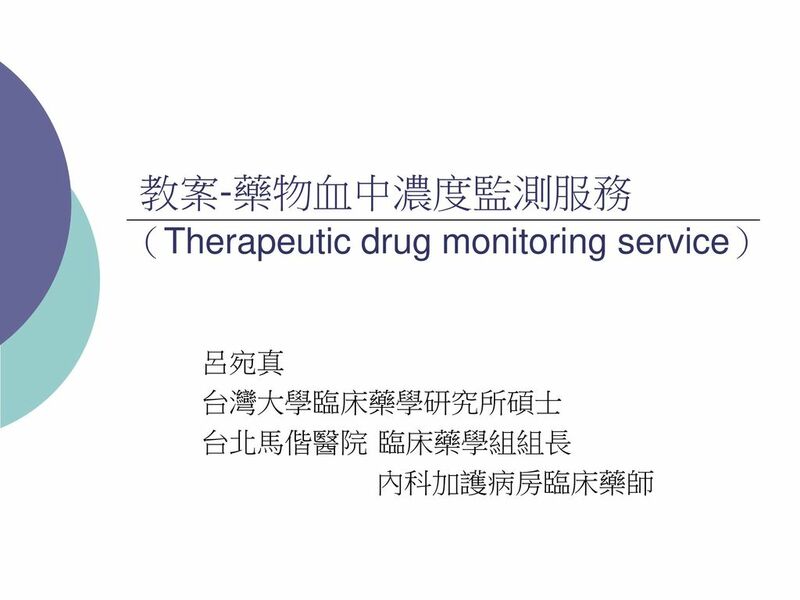 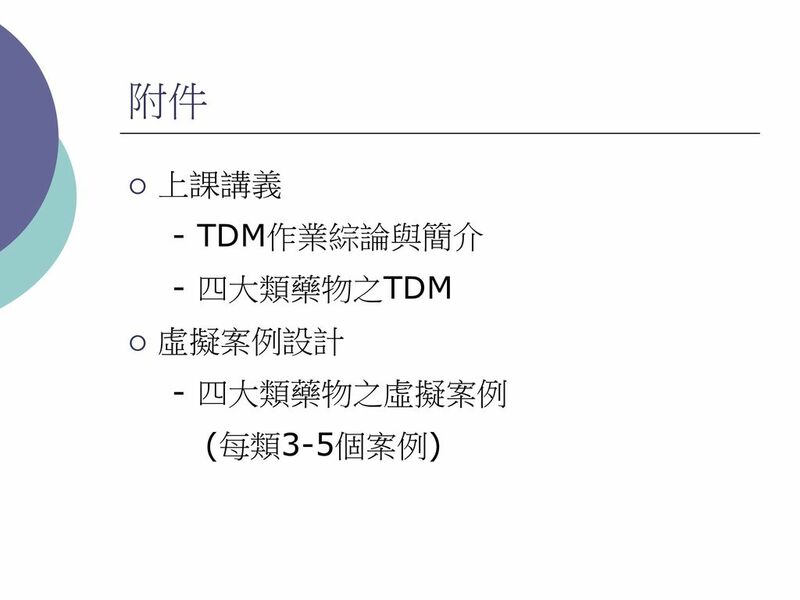 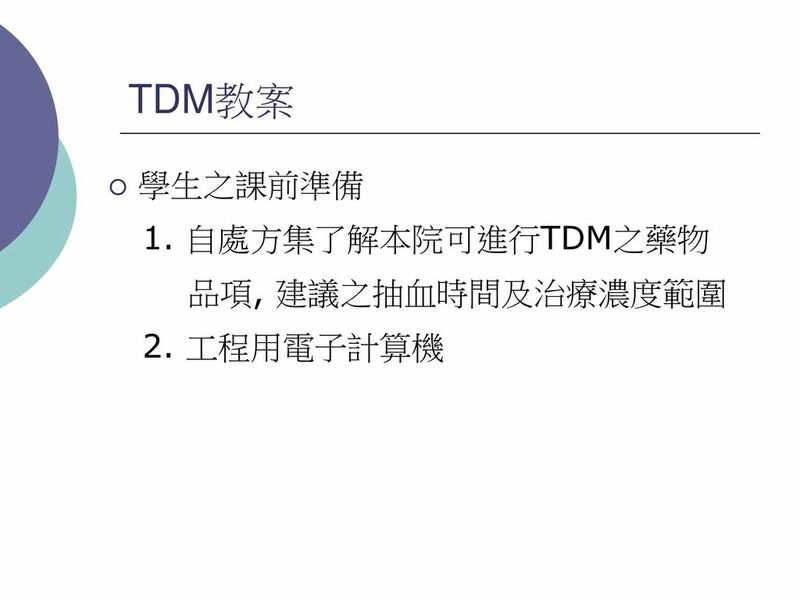 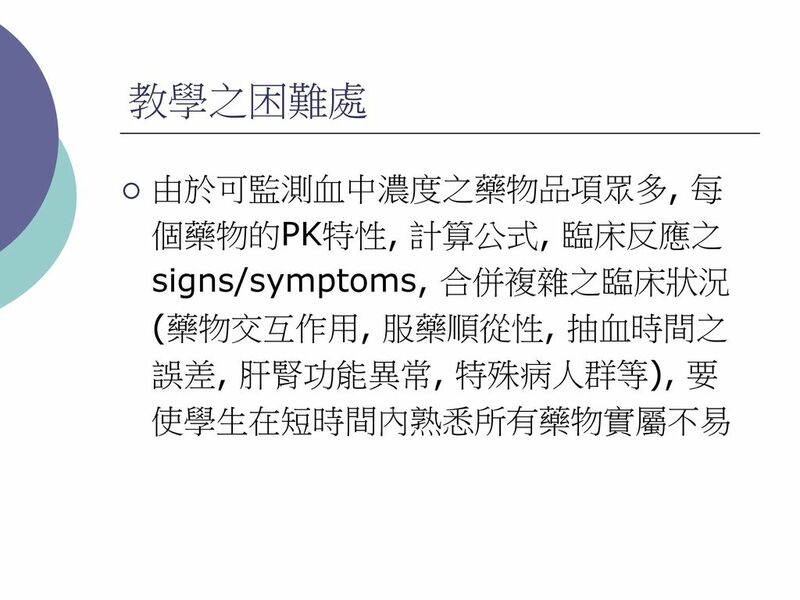 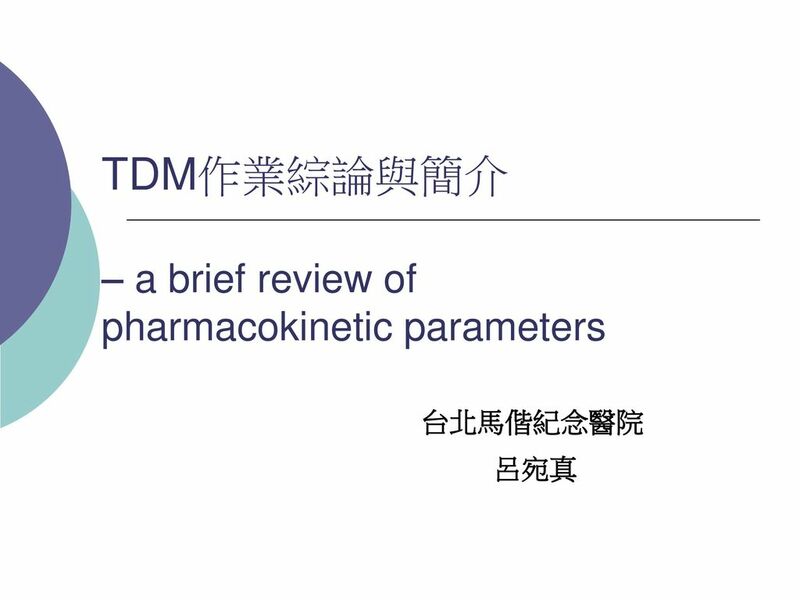 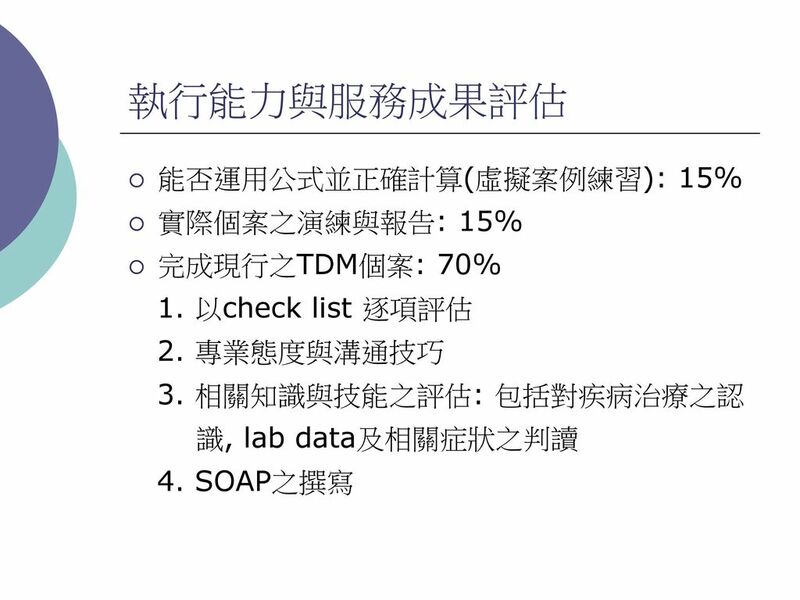 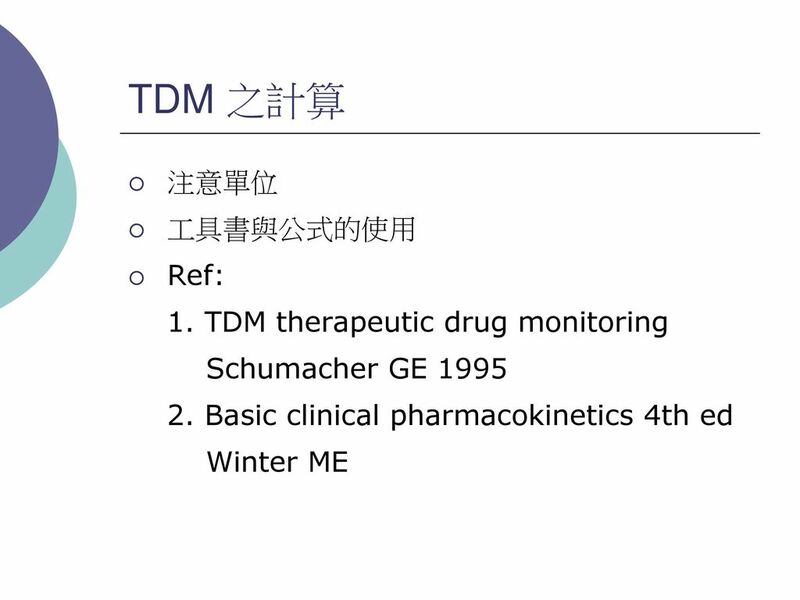 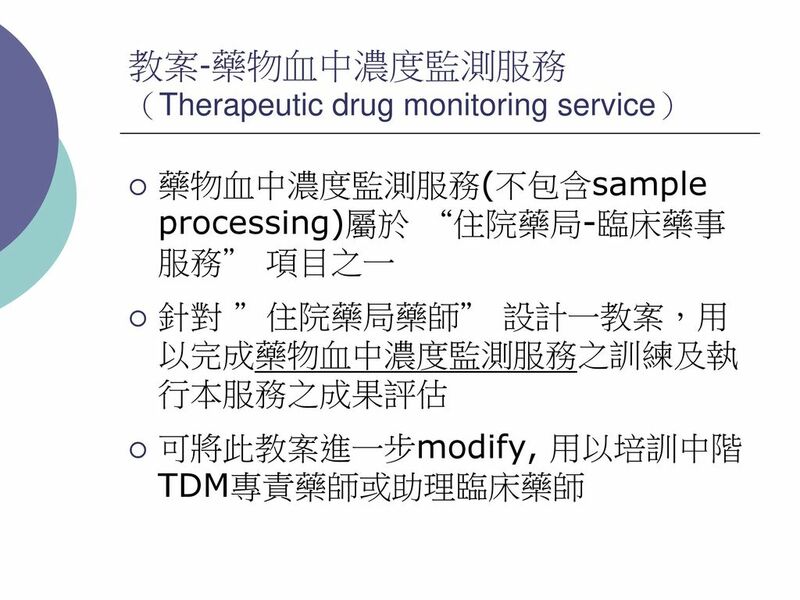 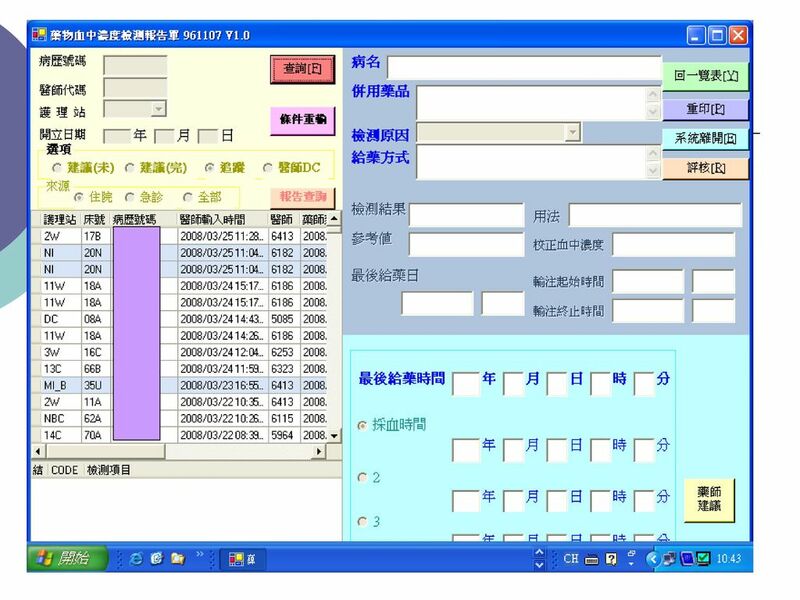 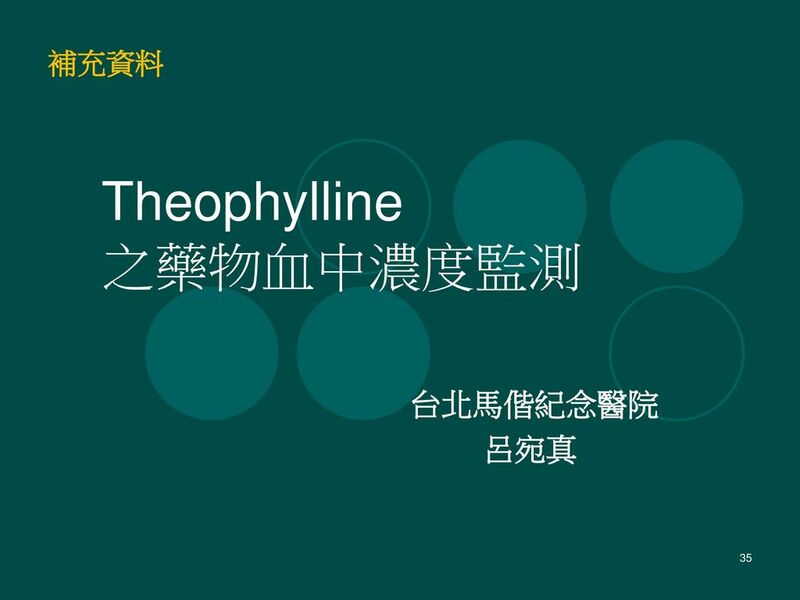 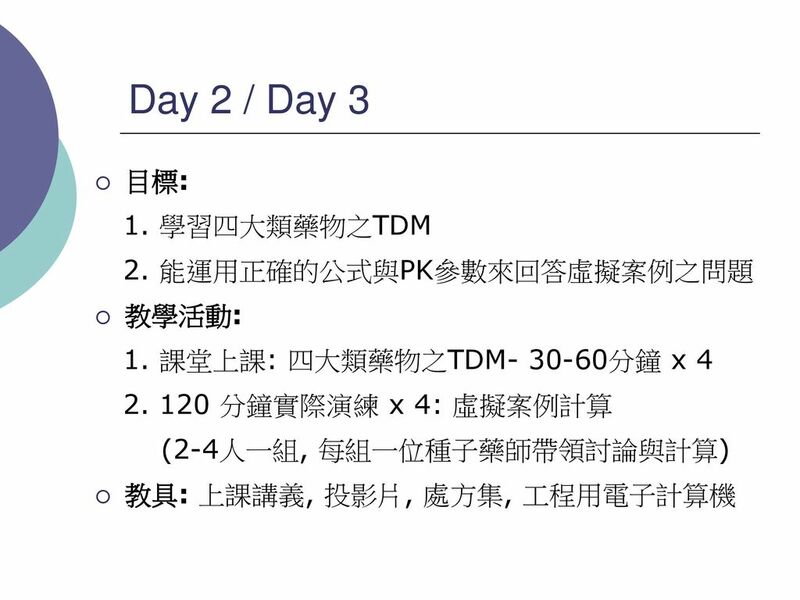 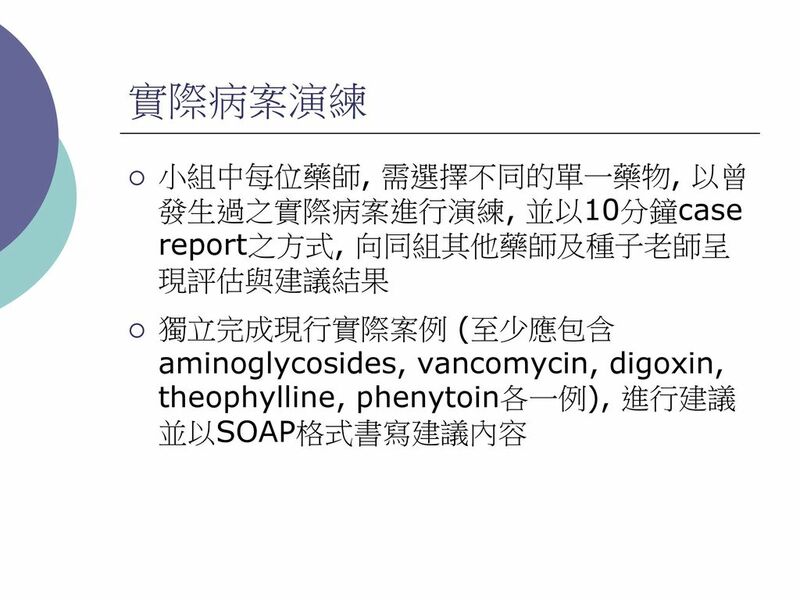 Download ppt "教案-藥物血中濃度監測服務（Therapeutic drug monitoring service）"
选项可猜测性评判与控制 实证研究 上海外国语大学 2008 级博士生 湖南师范大学外国语学院副教授 —— 邓杰. 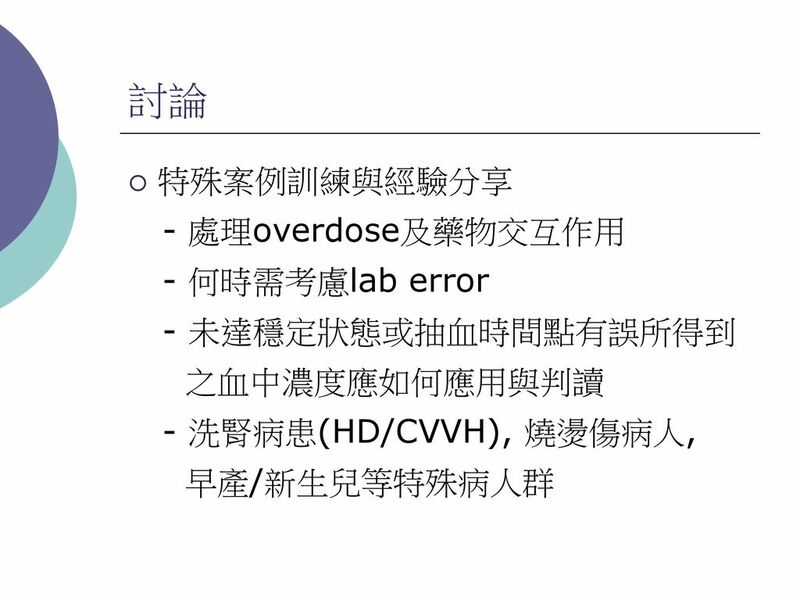 心肺脑复苏 Cardiopulmonary Cerebral Resuscitation ， CPCR. 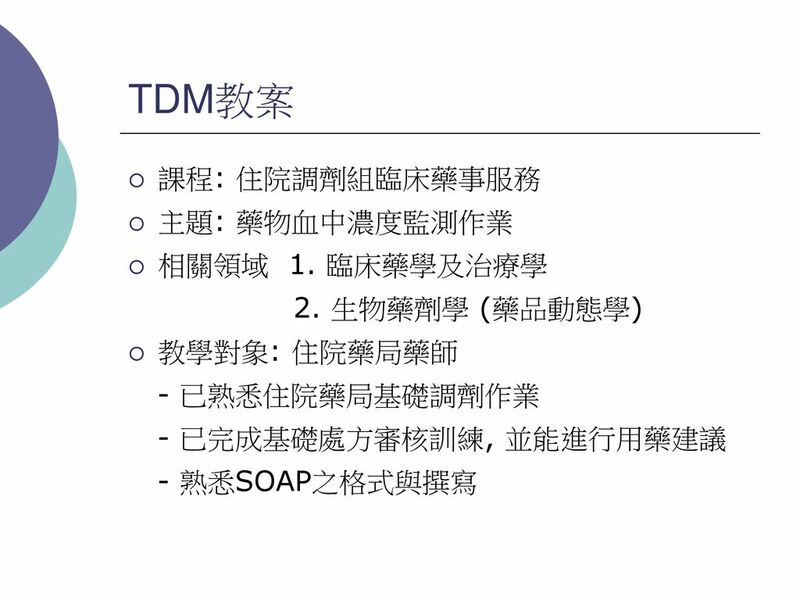 小兒科藥物性肝傷害案例討論 黃以信 教授 台北榮民總醫院 胃腸科主治醫師 行政院衛生署藥害救濟審議委員會 審議委員. 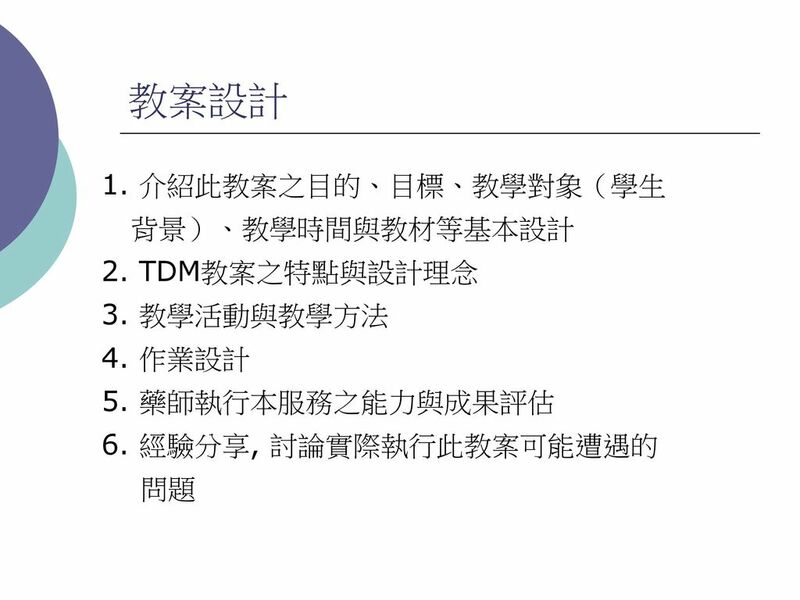 直接引语 间接引语 在交流中，我们经常会遇到需要引用或 转述别人的话的时候，这种引用或转述别 人的话称之为引语。 引述别人的话一般采用两种方式：一种 是原封不动地引述别人的话，并将它放在引 号内，称为直接引语 (Direct Speech) ；另一 种是用自己的话转述别人的话，被转述的话 不放在引号内，称为间接引语. 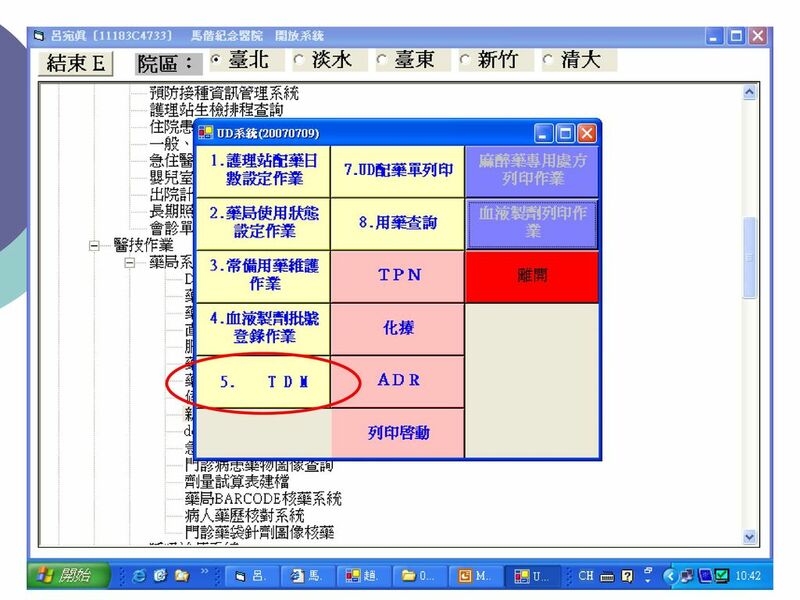 全国卷书面表达备考建议 广州市第六中学 王慧珊 Aug. 24th, 2015.